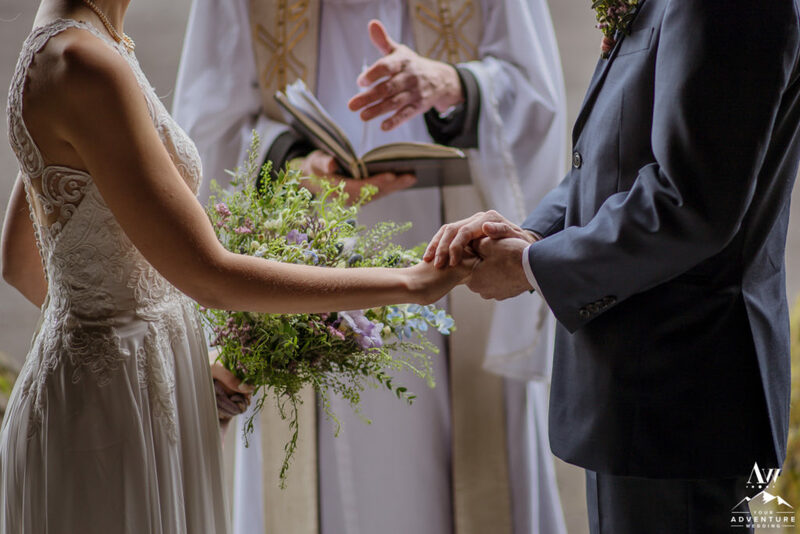 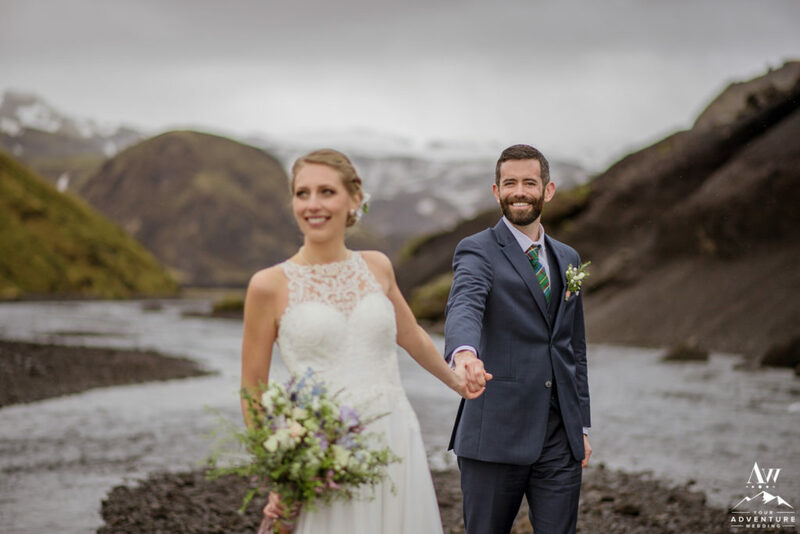 From the second Jacalyn and Michael’s email inquiry came in Fall of 2016, we instantly knew they would be one of those clients we would want to keep hitting the rewind button on. 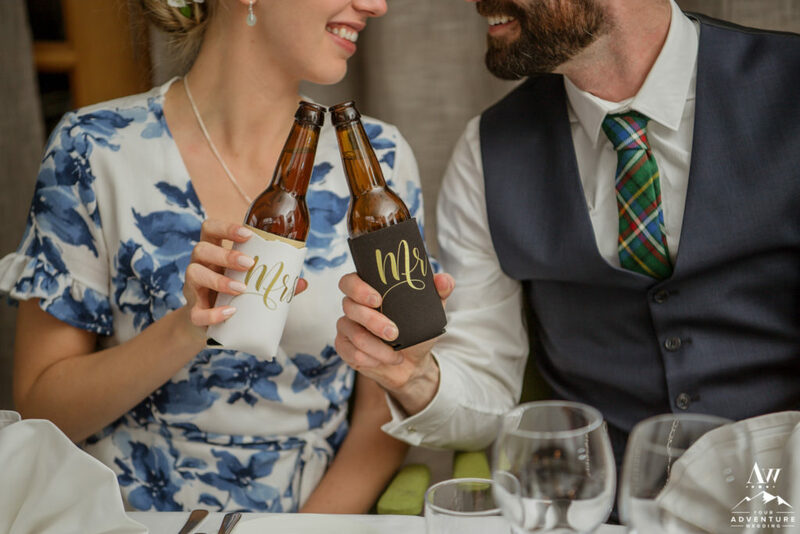 So needless to say there was so much freaking anticipation until their April 2018 wedding date arrived! 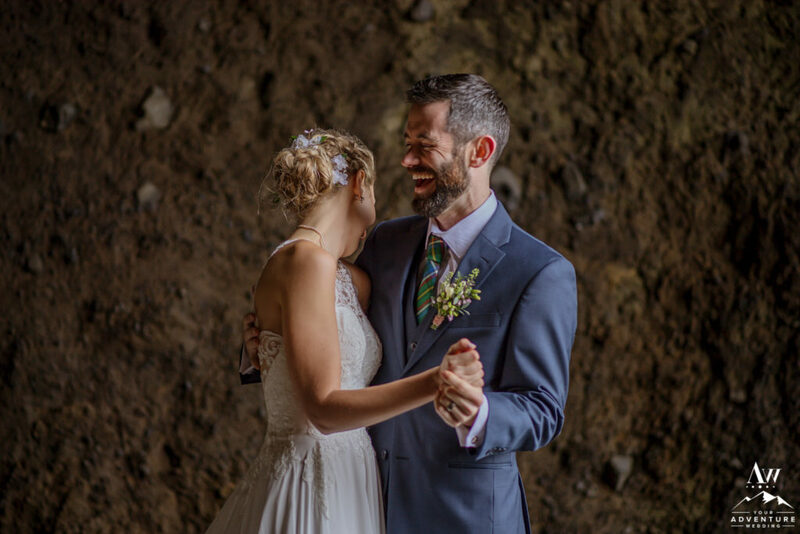 The energy these two exude is contagious, they are the kind of folks you hope to become lifetime friends with. 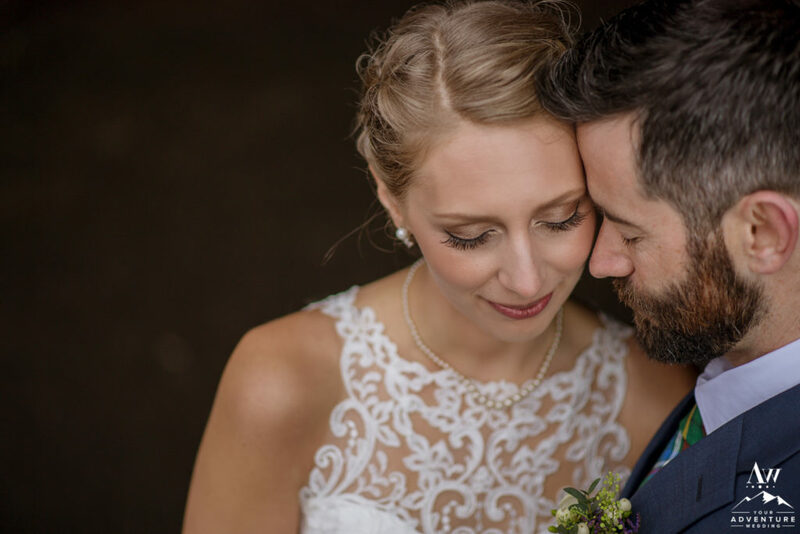 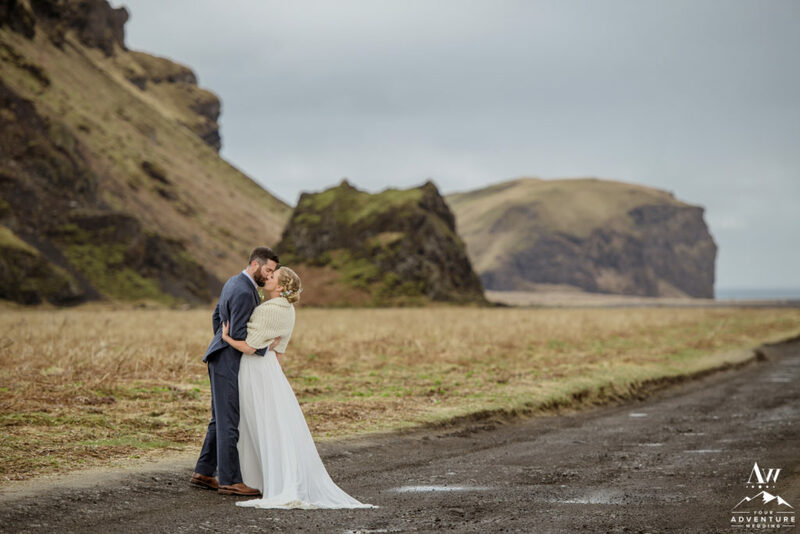 But before we gush about their thrilling Southern Iceland wedding adventure of Jacalyn + Michael, let us set the scene a bit more for you and tell you about them! 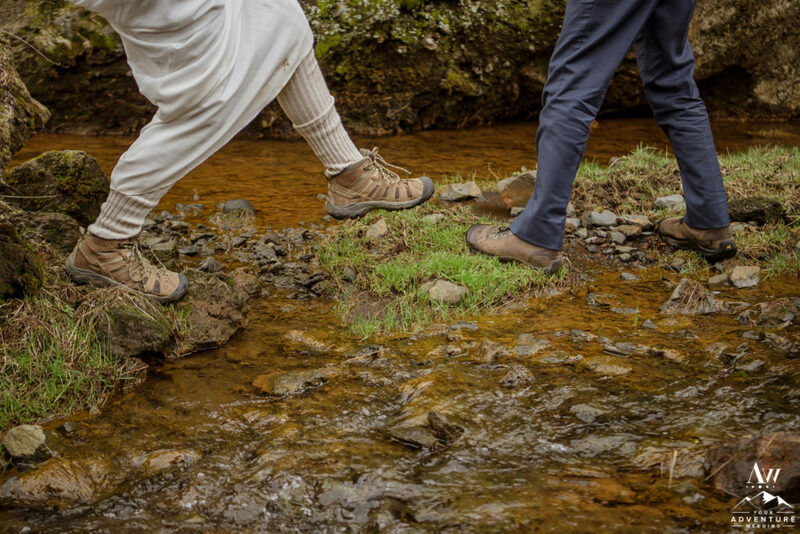 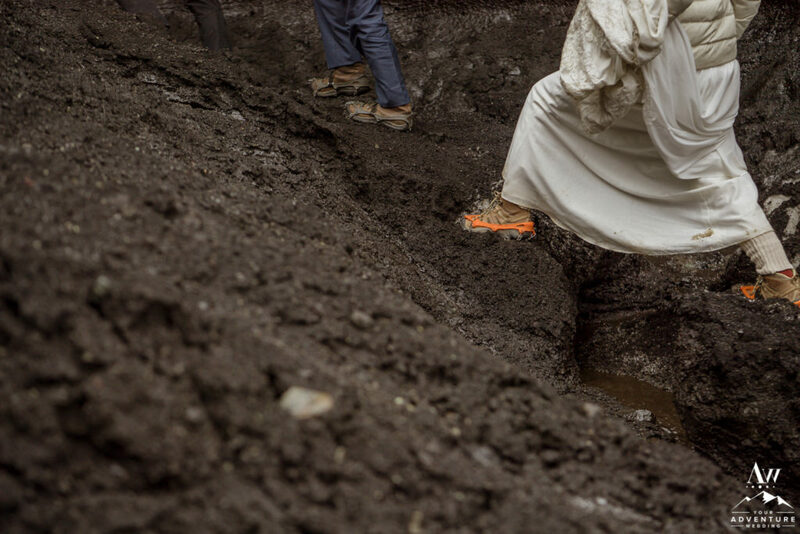 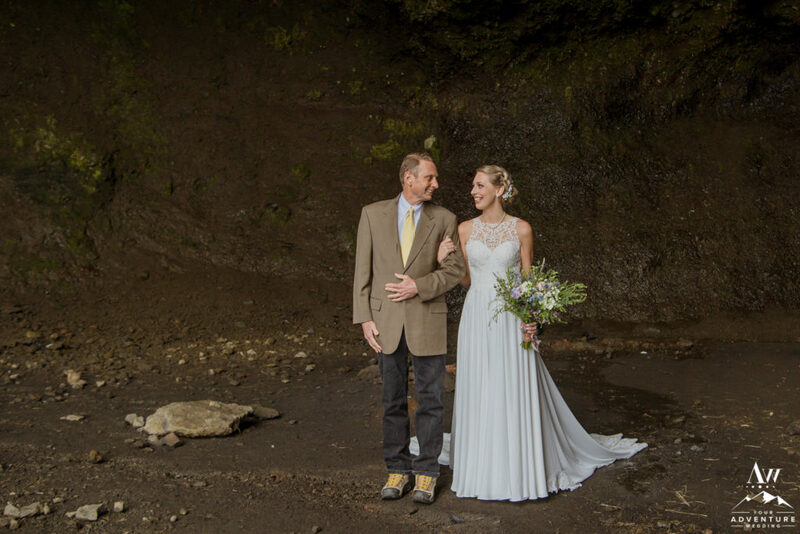 After love at first intervened, Jacalyn and Michael found themselves talking about their adventures caving and love of maps, over a pint of Guinness at a bar in Wisconsin. 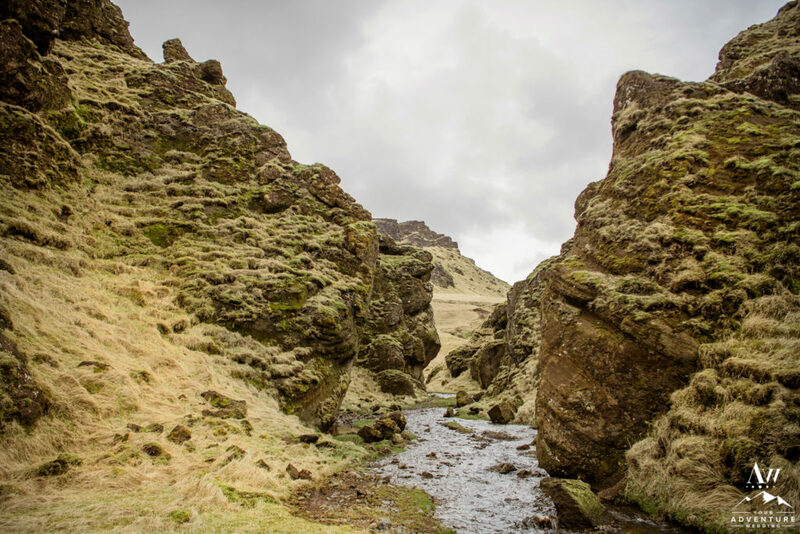 Somewhere the pint of beer transitioned to lakeside exploration. 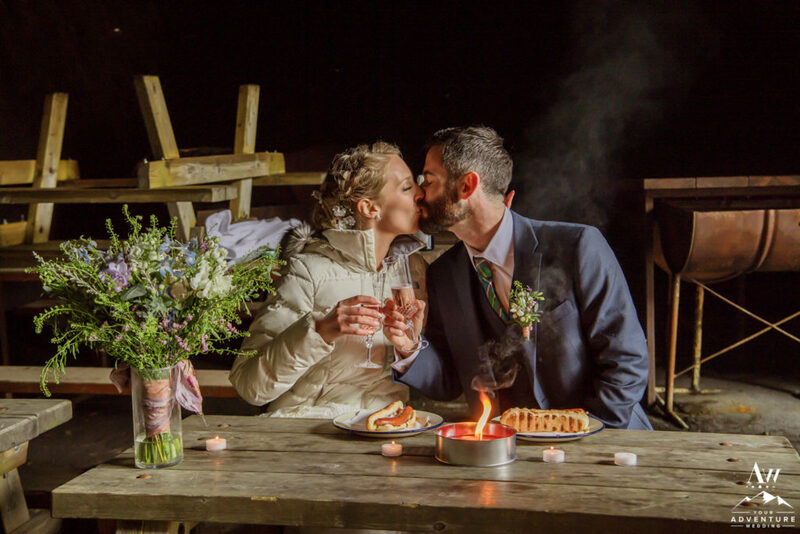 Their first date was well over seven hours and both left utterly in awe over the spark they experienced. 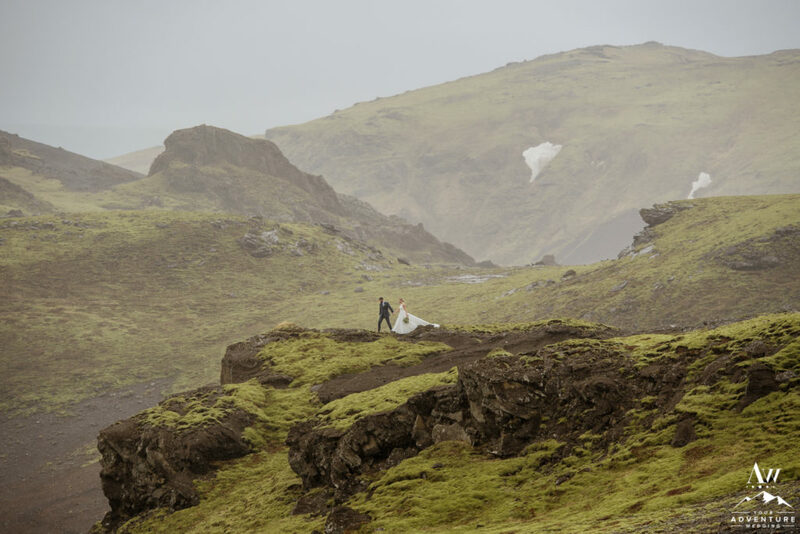 An immense love of travel, nature, and the drive of constantly seeking new experiences fills their relationship tank. 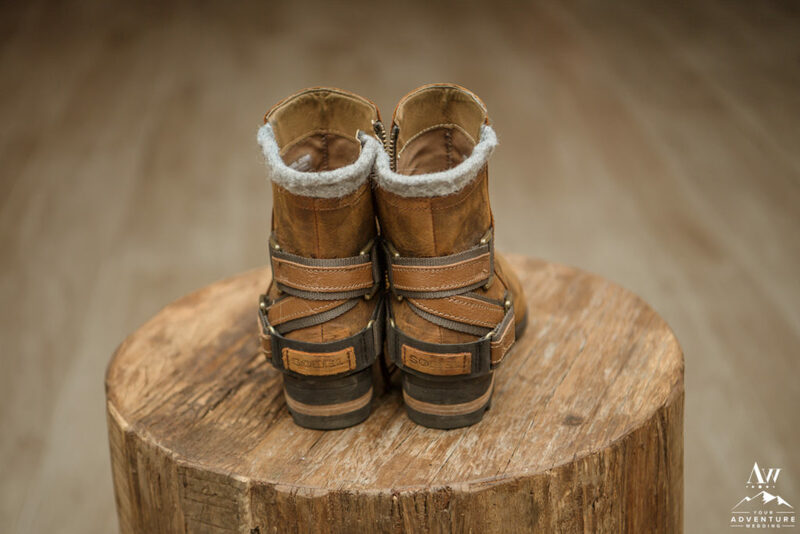 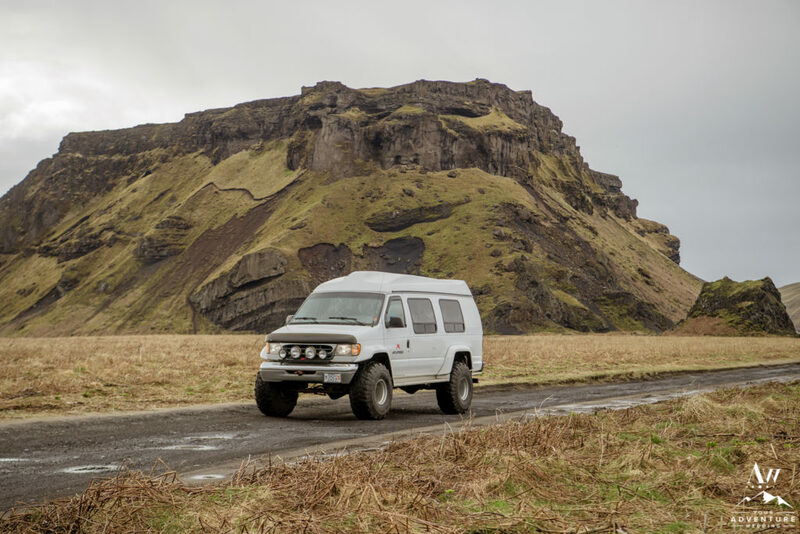 From road tripping, flying, camping or even a simple bike ride, they found the easy rhythm on how to adventure together. 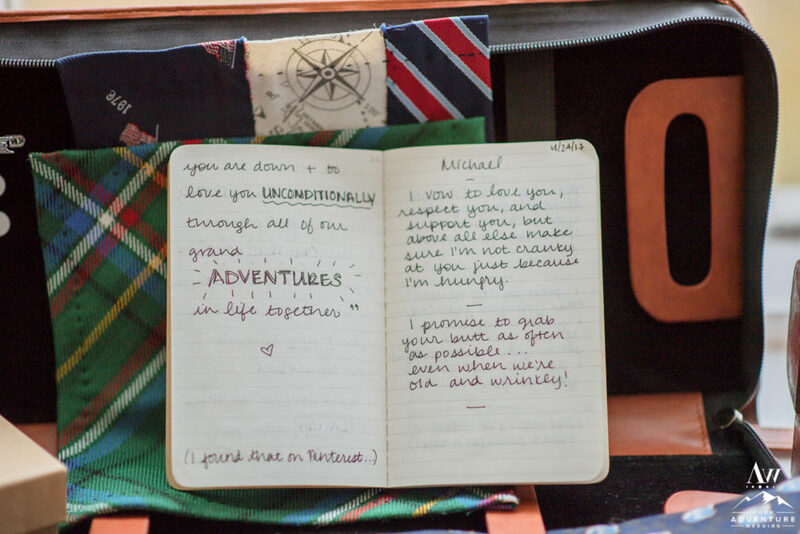 Jacalyn said it best during our Skype call that they rely on ensuring “planned spontaneity” is apart of their journey together. 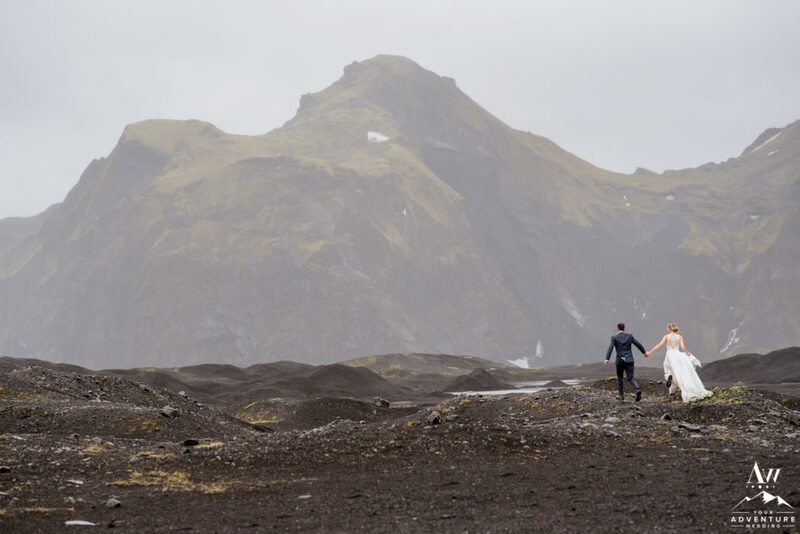 Meaning that they roll with the punches and deal with detours from their planned lists and improvising as the situation arises. 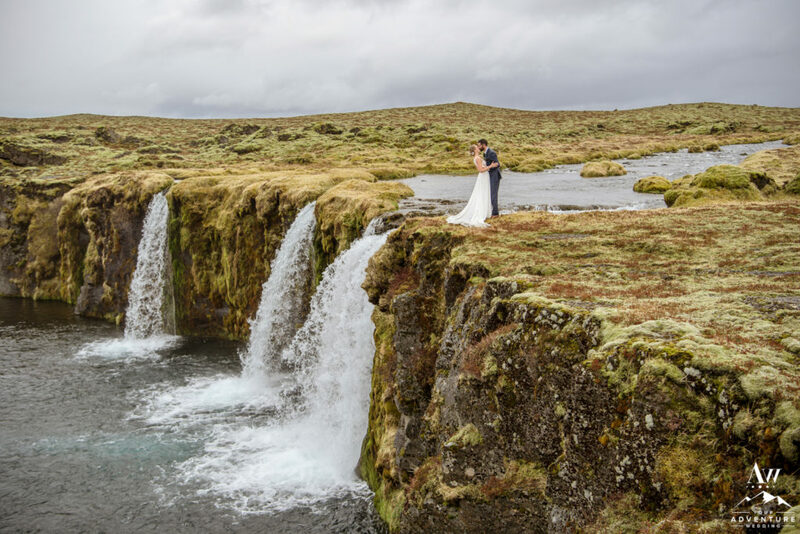 Fast forward 2 years when Michael was planning to cleverly propose to Jacalyn! 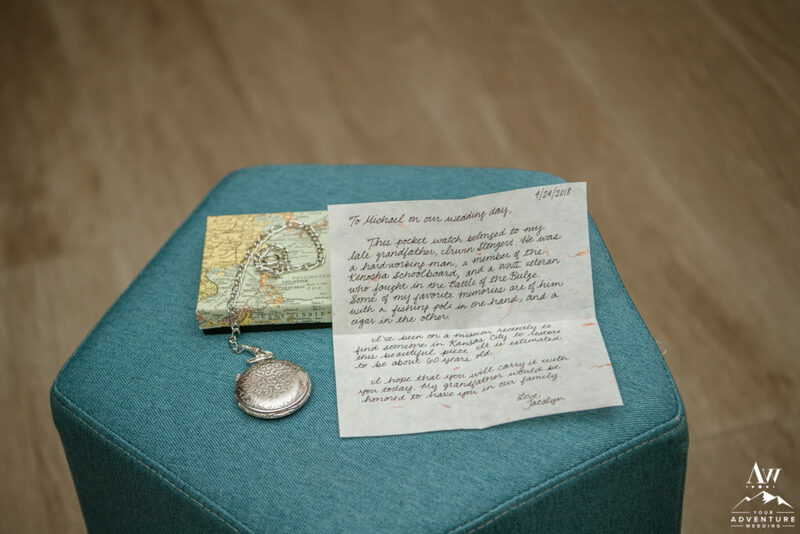 Think: Turning your hope into the ultimate romantic escape with a 1950’s map and Christmas lights that spell out the life changing question, “Will You Join Me for a Lifetime of Team Adventure?” As soon as Jacalyn came home after work, she boasted in joy and said YES! 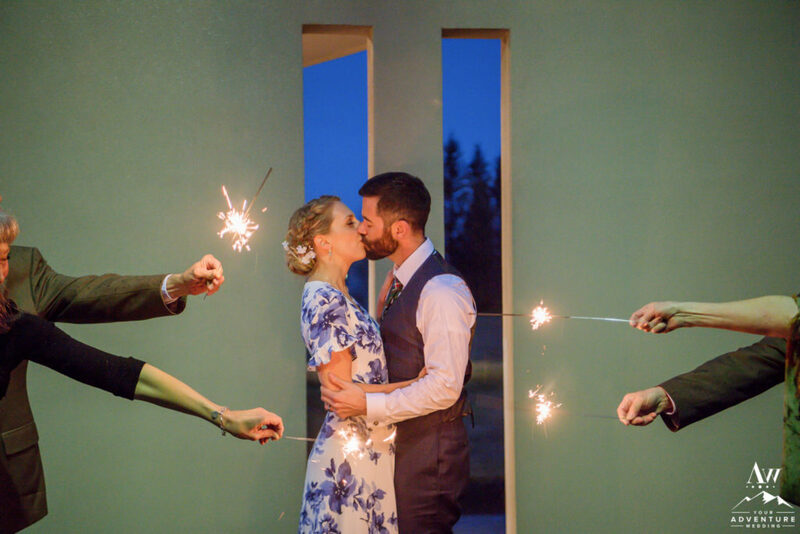 Realizing a traditional wedding back in the USA didn’t really fit them, they yearned for more. 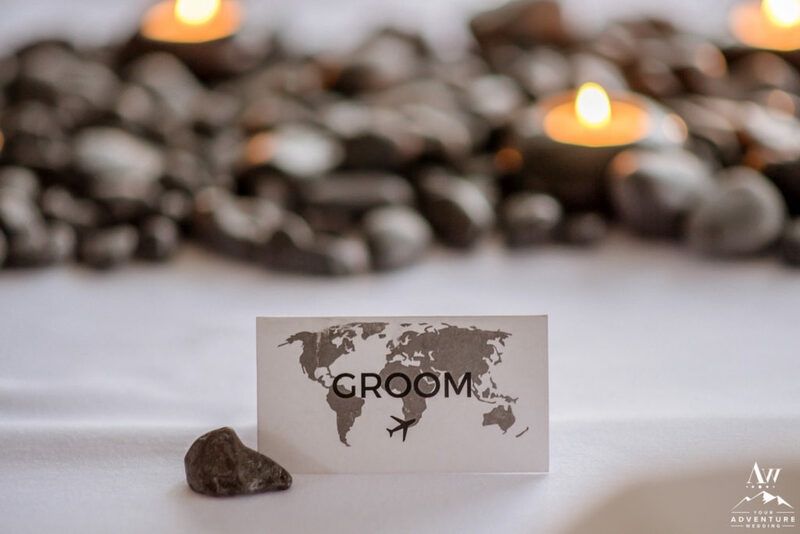 In the words of Michael he says, “we would love to get married in a way and a place that is true to who we are, together.” Since the beginning of their relationship they began drawing a map of all of the destinations they want to conquer together. 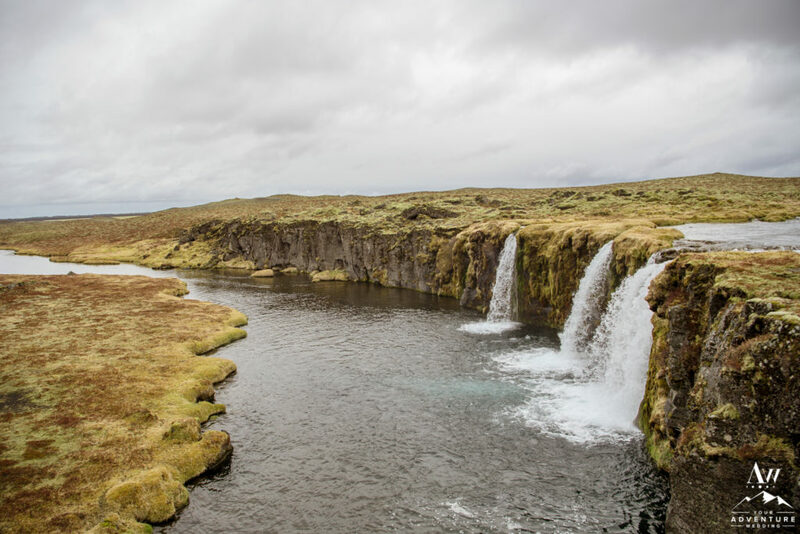 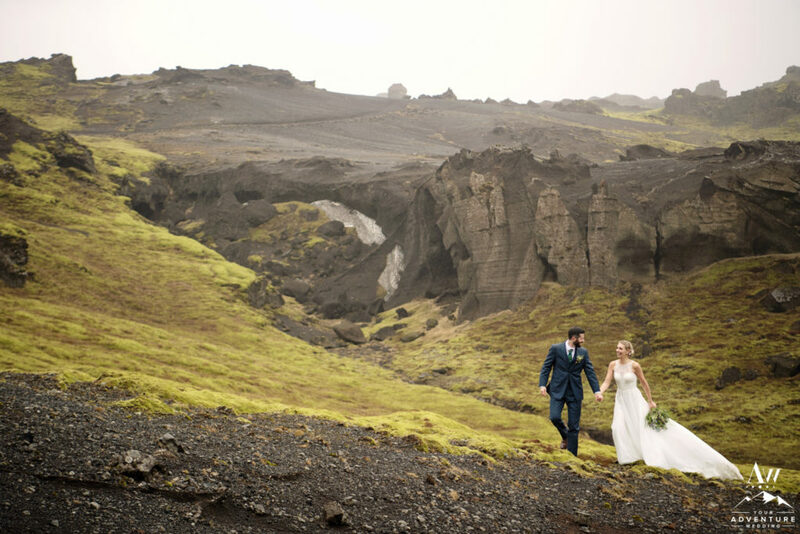 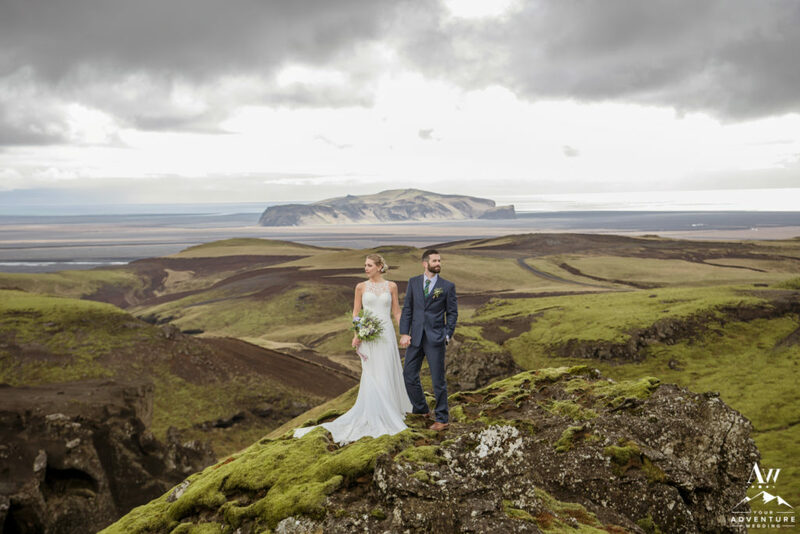 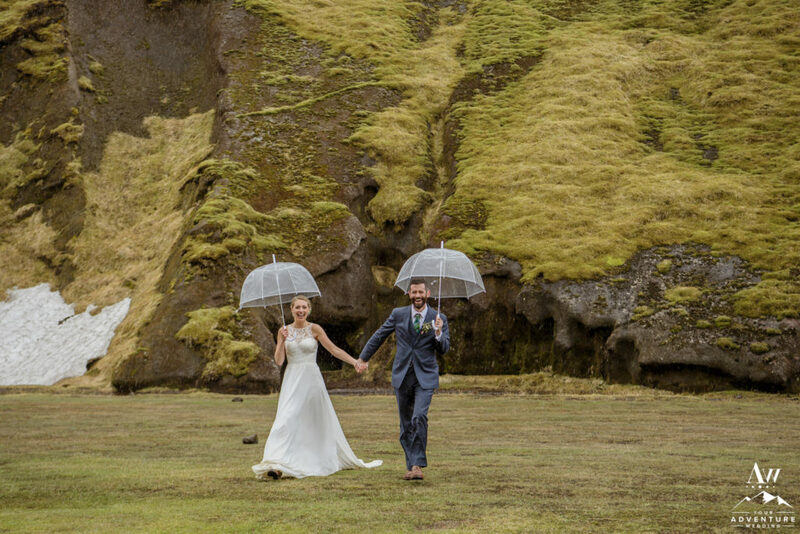 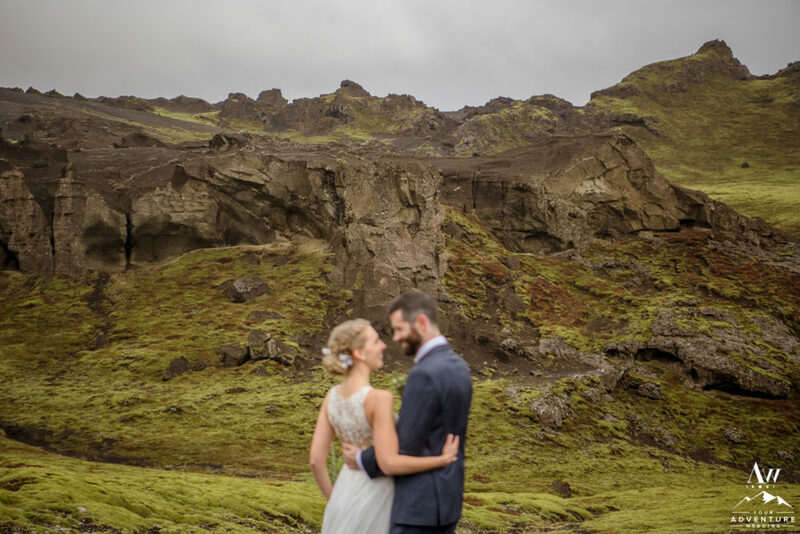 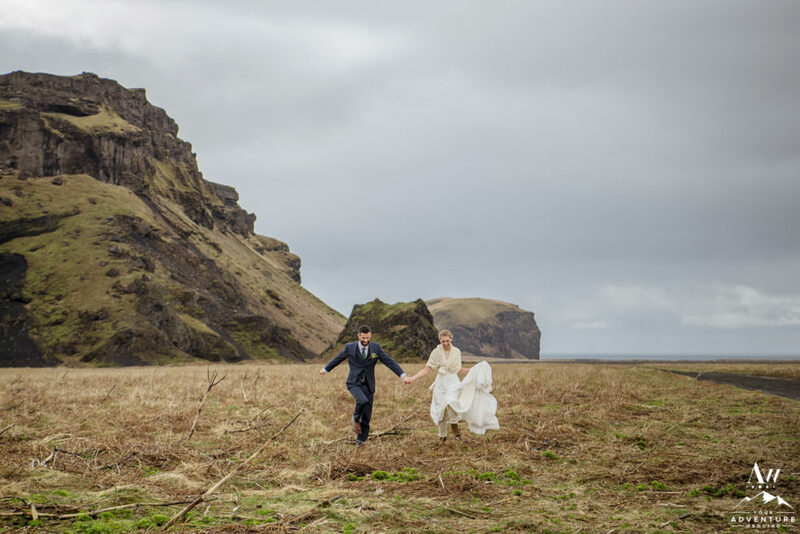 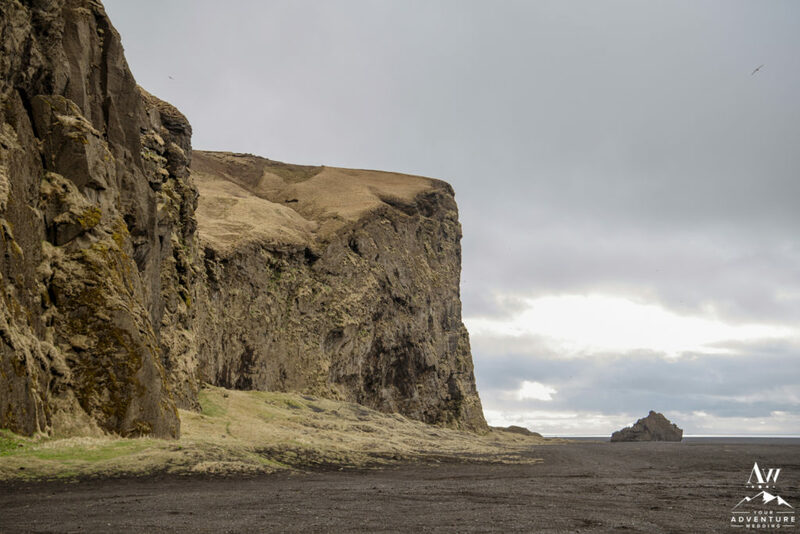 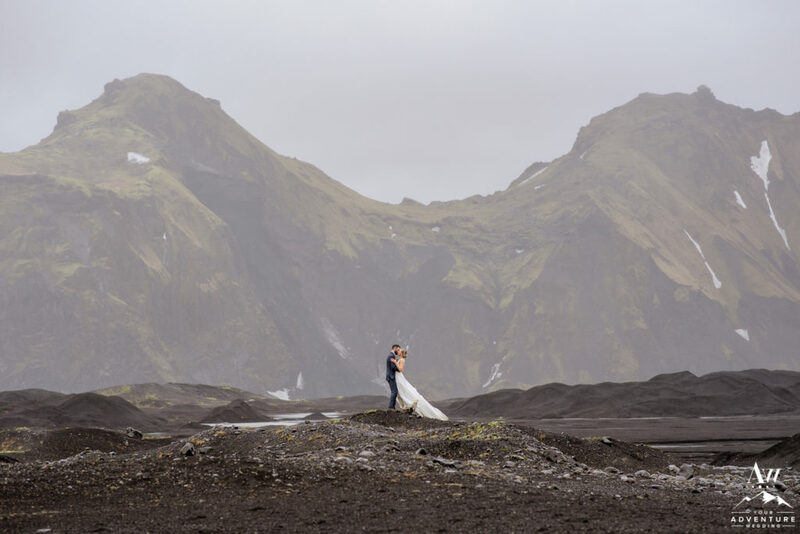 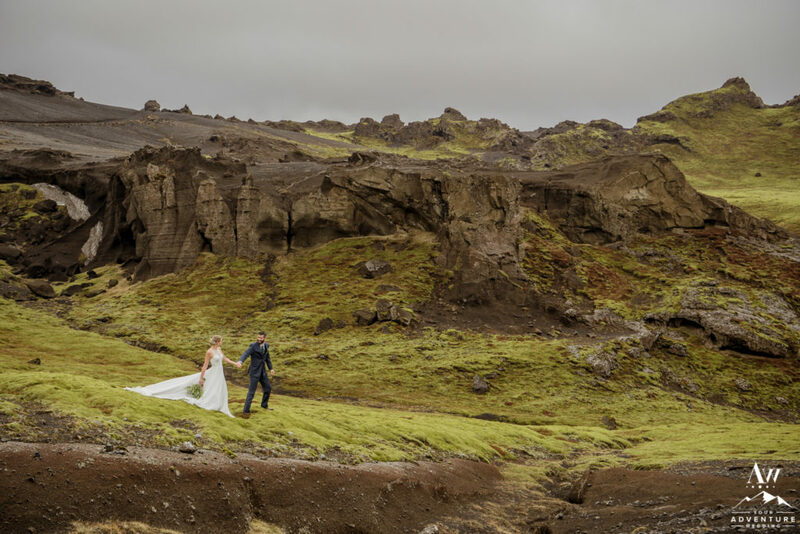 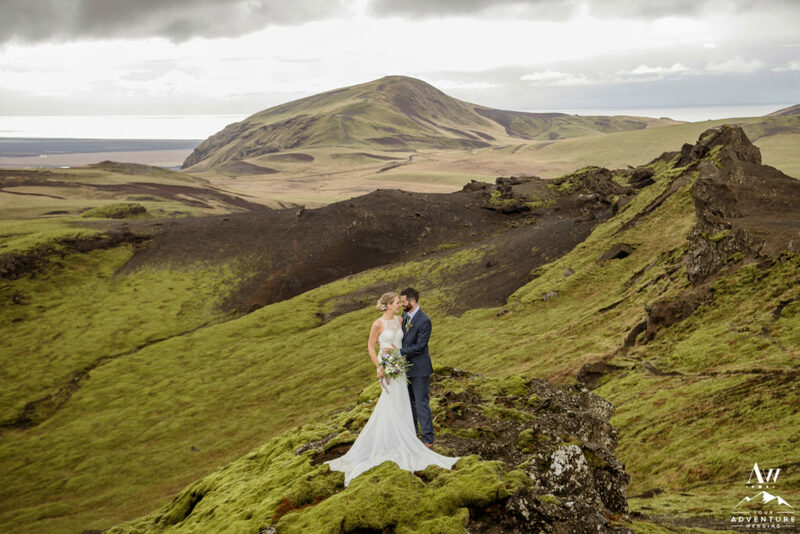 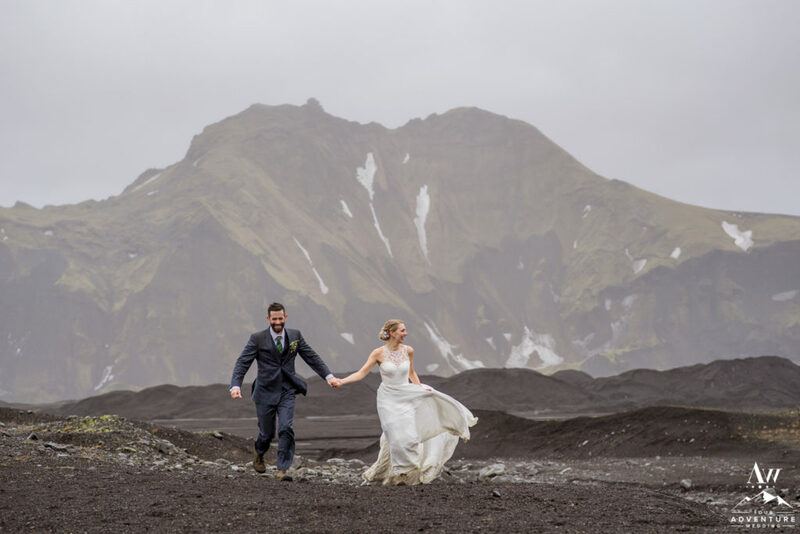 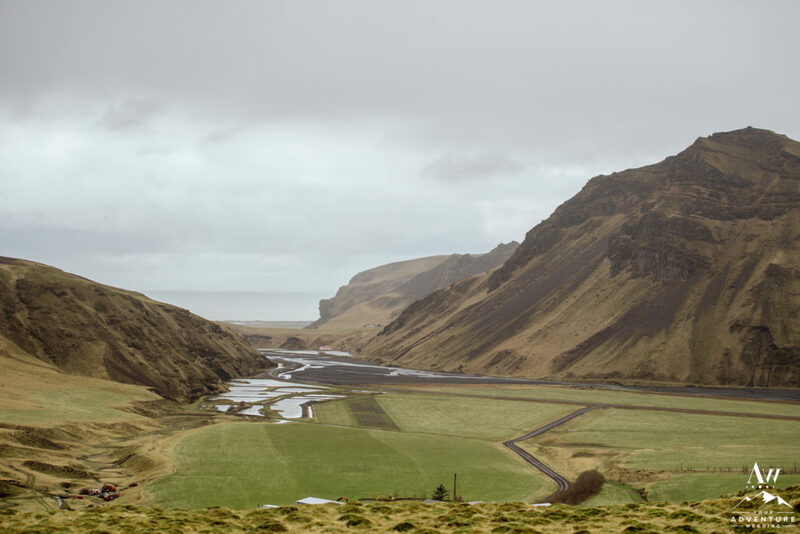 Iceland kept climbing over all of the others, so when they began talking about where they would have their destination wedding, it was a no-brainer! 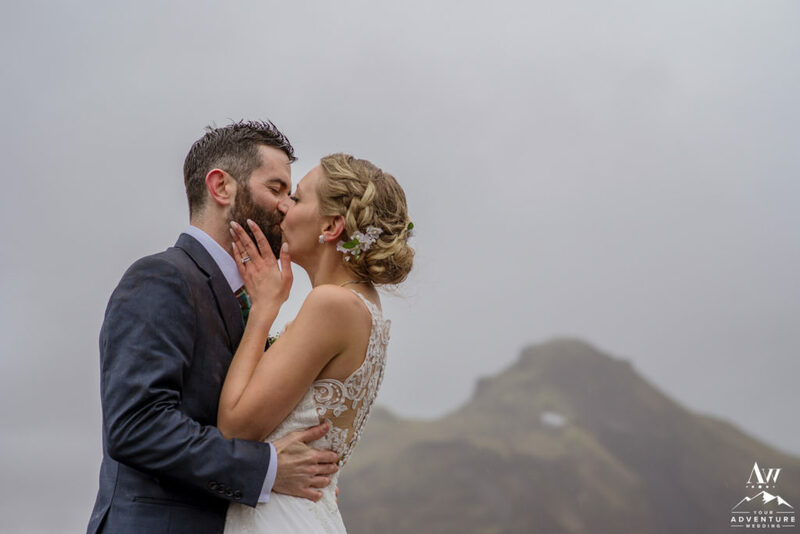 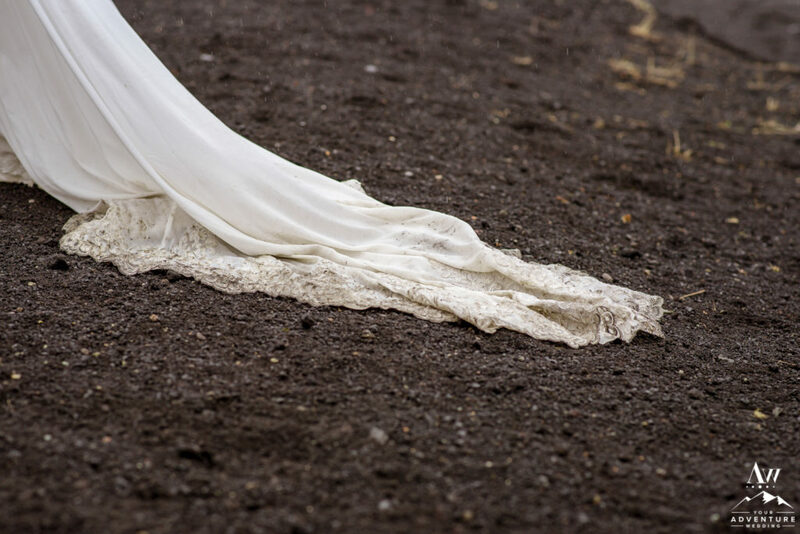 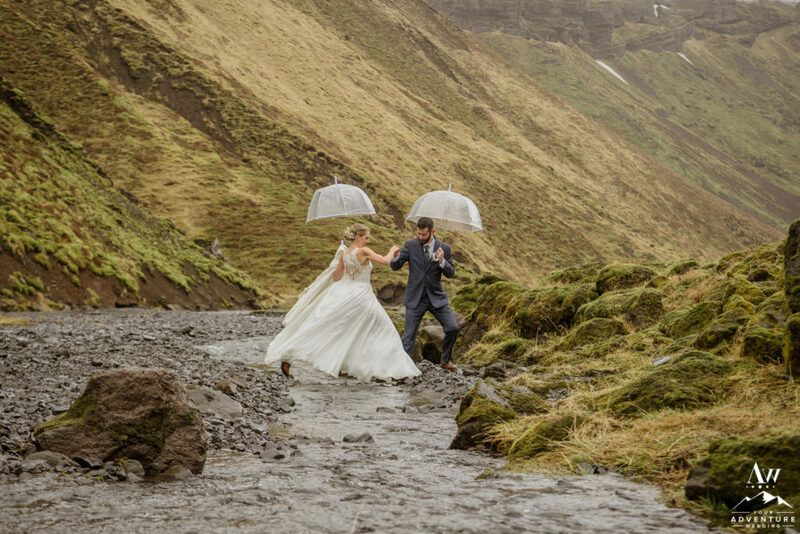 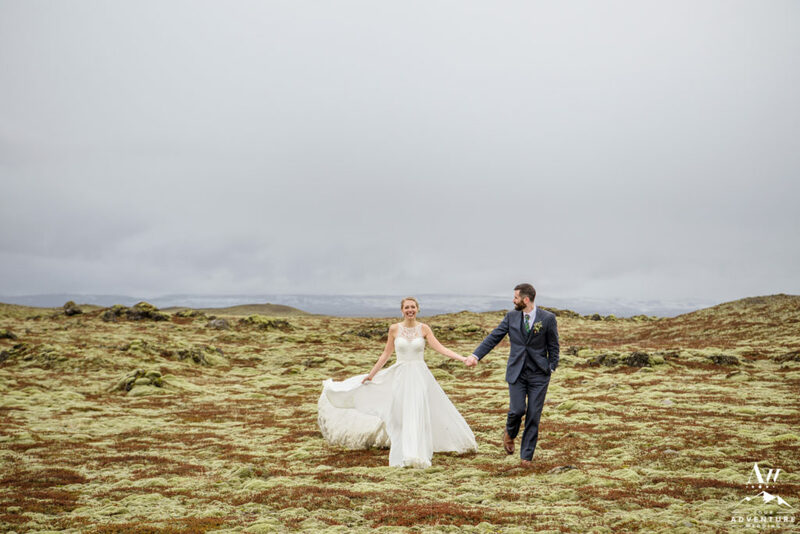 I mean who doesn’t want to embrace the unruly dramatic weather, variety of landscapes, and the epic amount if stunning Iceland wedding photos?! 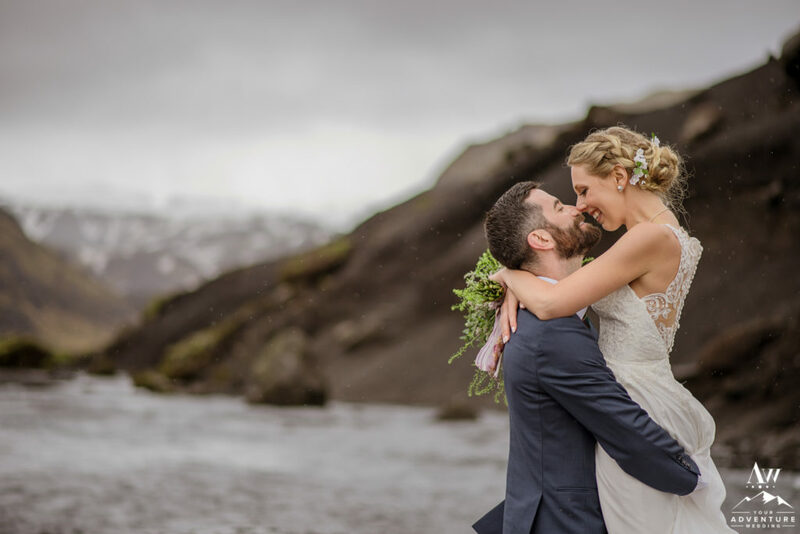 So we invite you along with us today to relive their incredible Southern Iceland wedding adventure day! 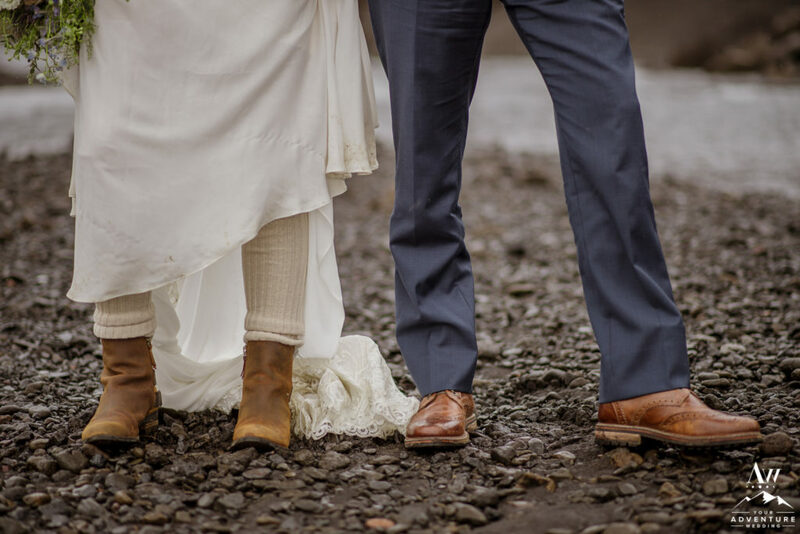 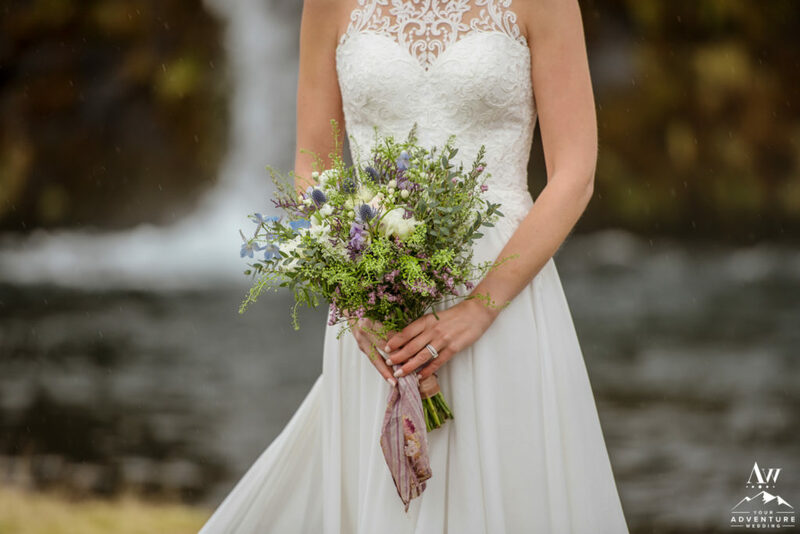 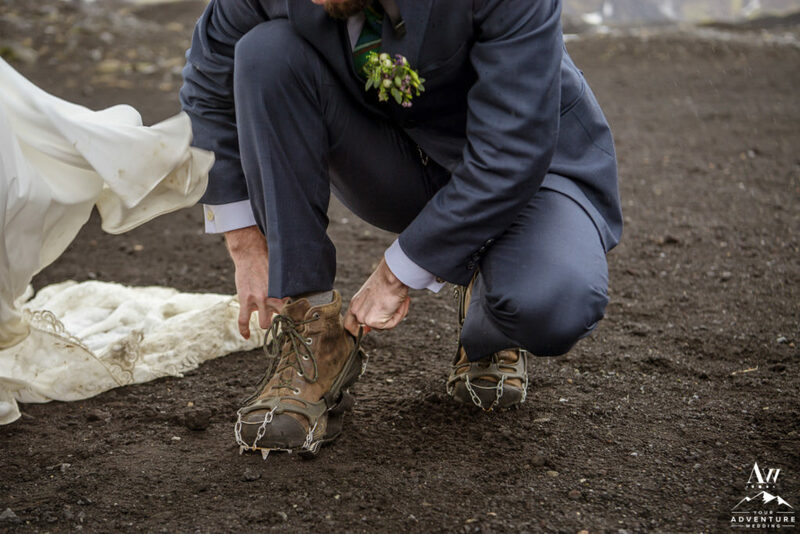 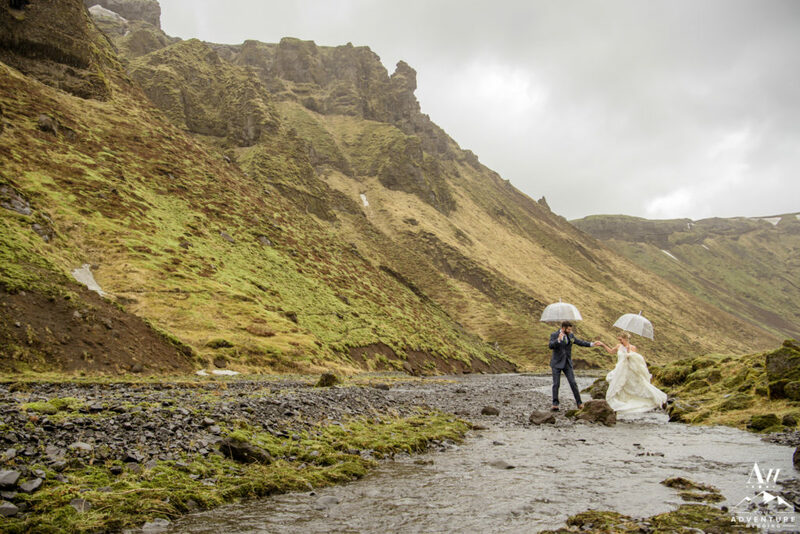 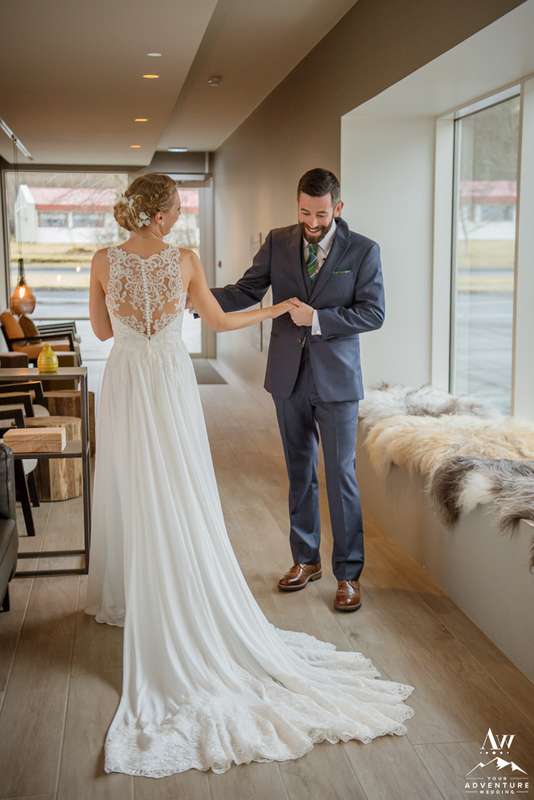 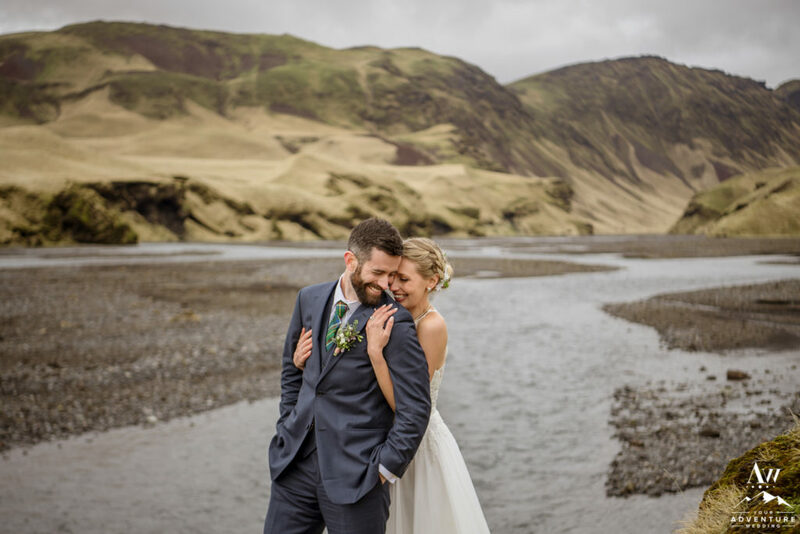 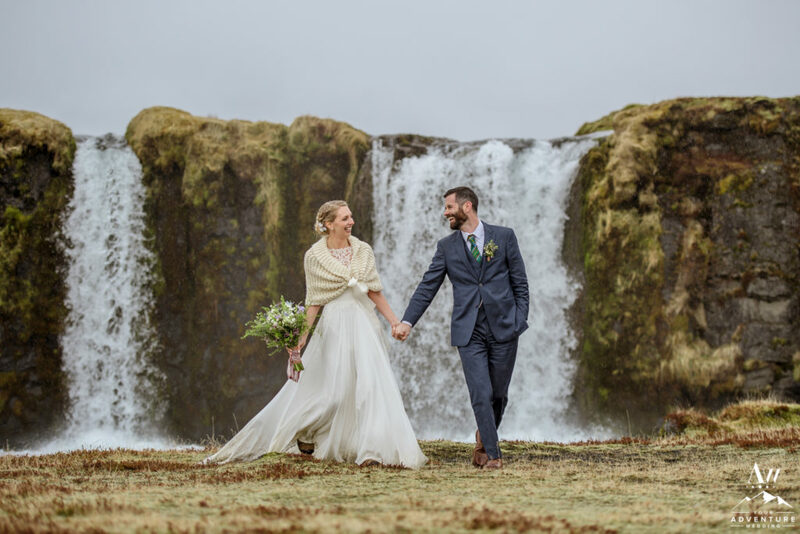 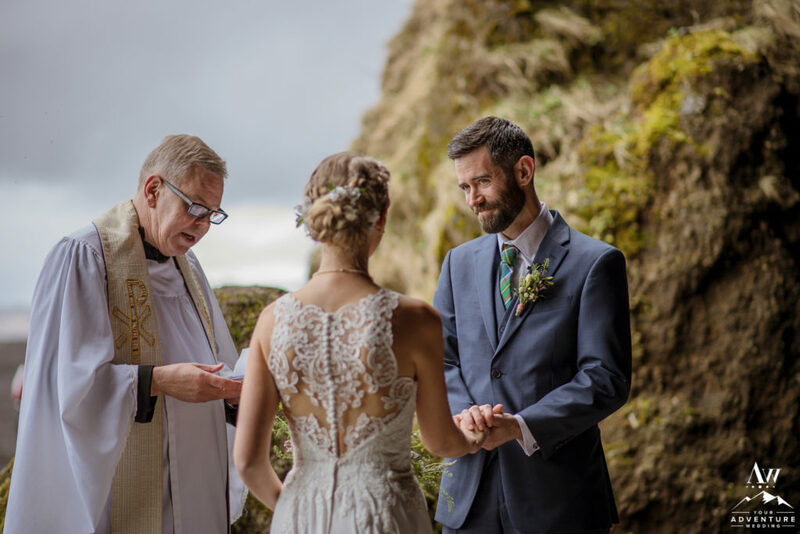 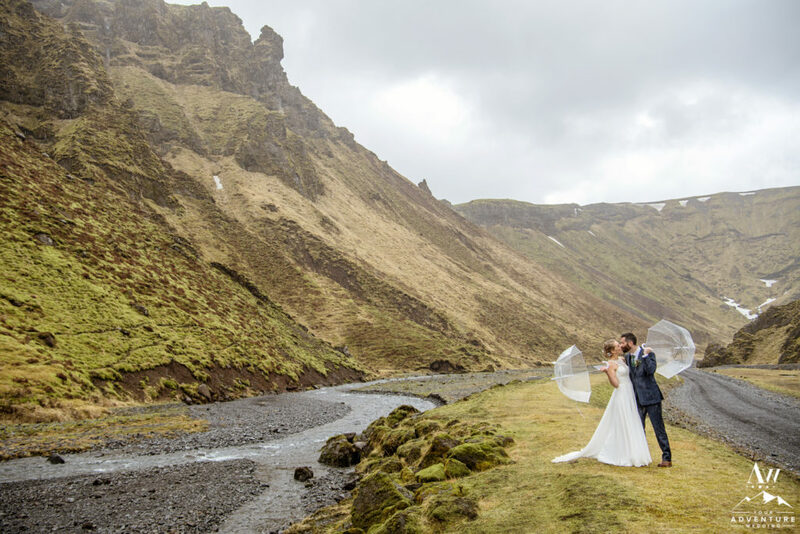 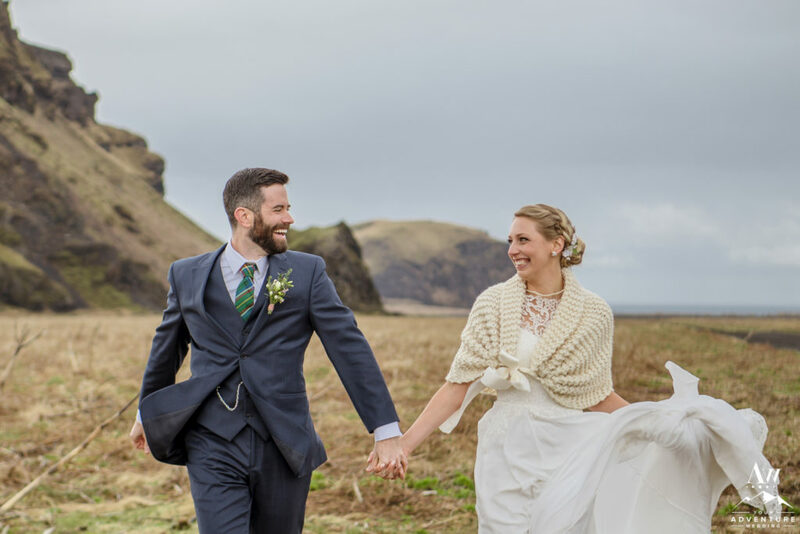 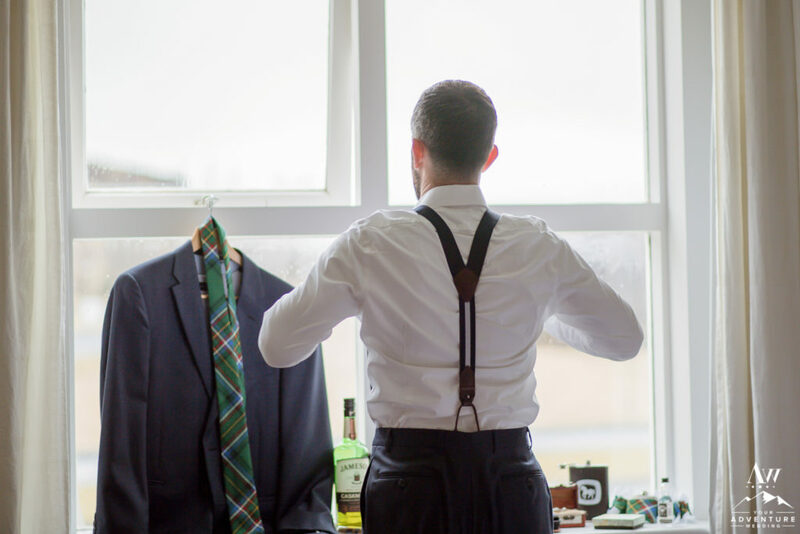 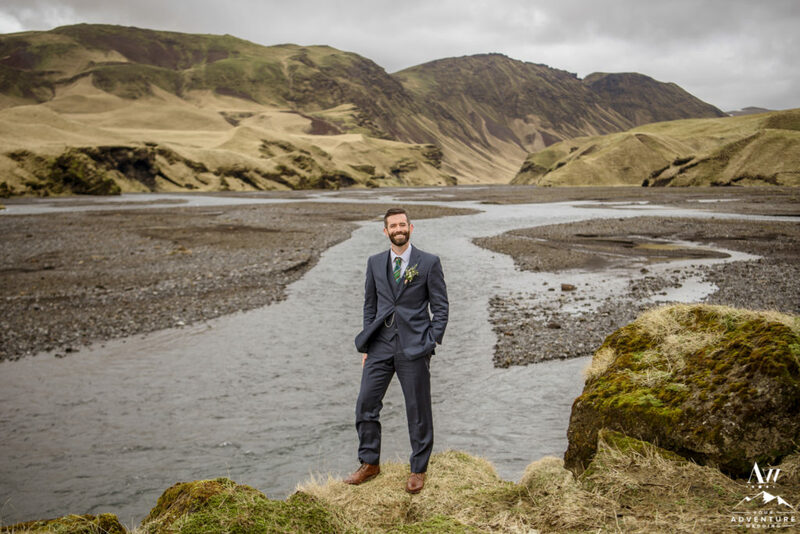 During winter weddings in Iceland (November-April), weather continues to be fickle, but Jacalyn, Michael, and their parents as guests were ready to embrace anything mother nature dealt! 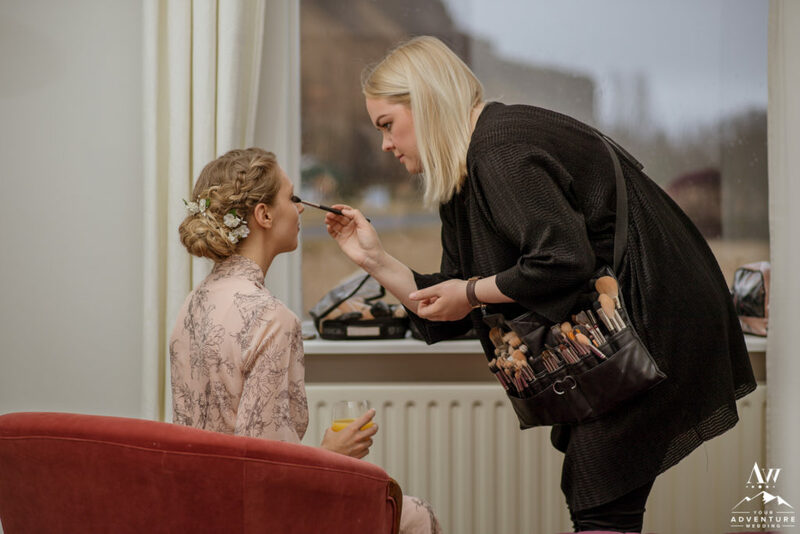 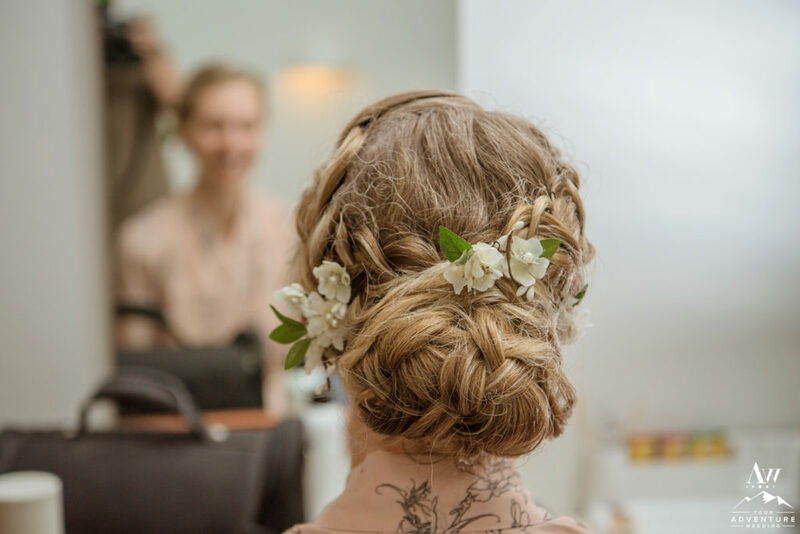 The southern Iceland wedding adventure morning began around 5am at one of our favorite wedding hotels, Icelandair Klaustur with our hair and makeup team beautifying Jacalyn! 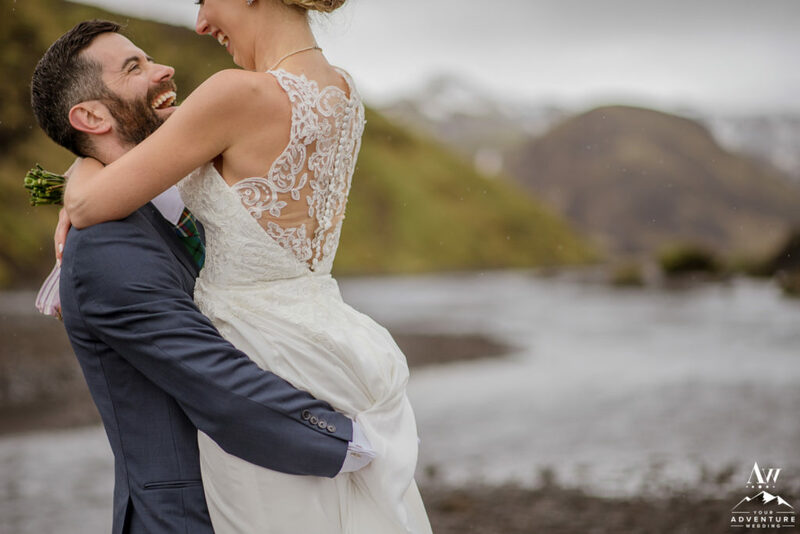 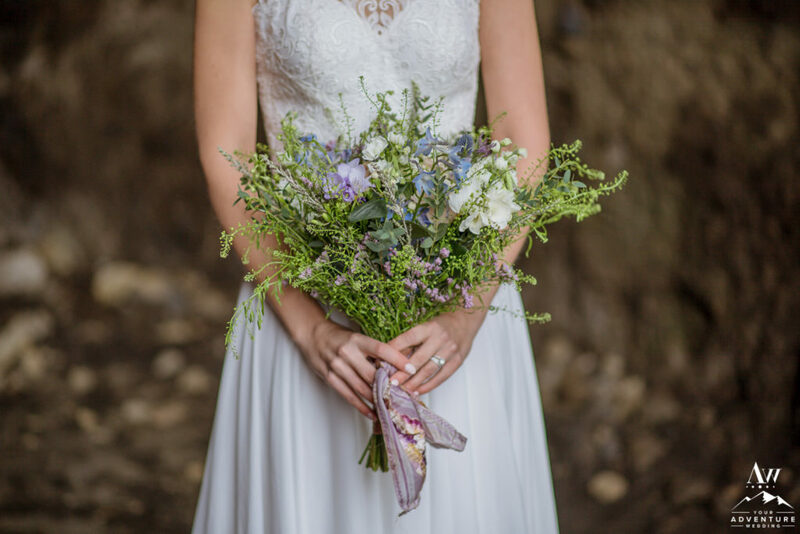 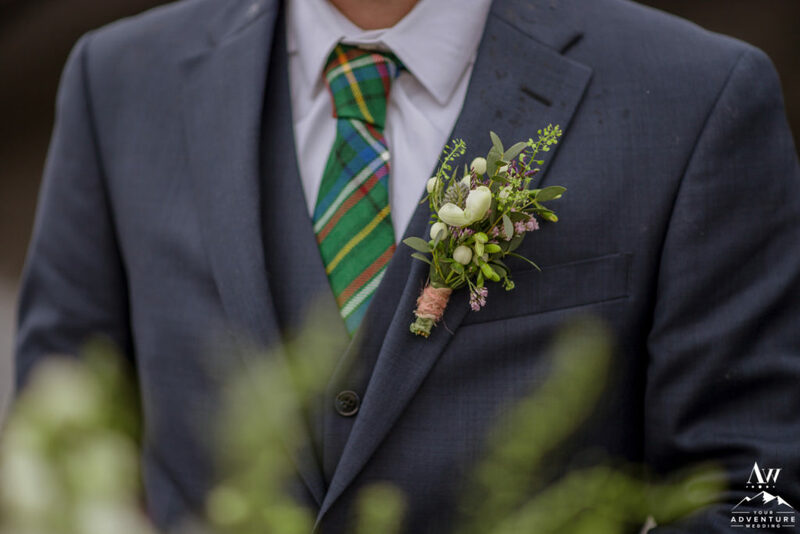 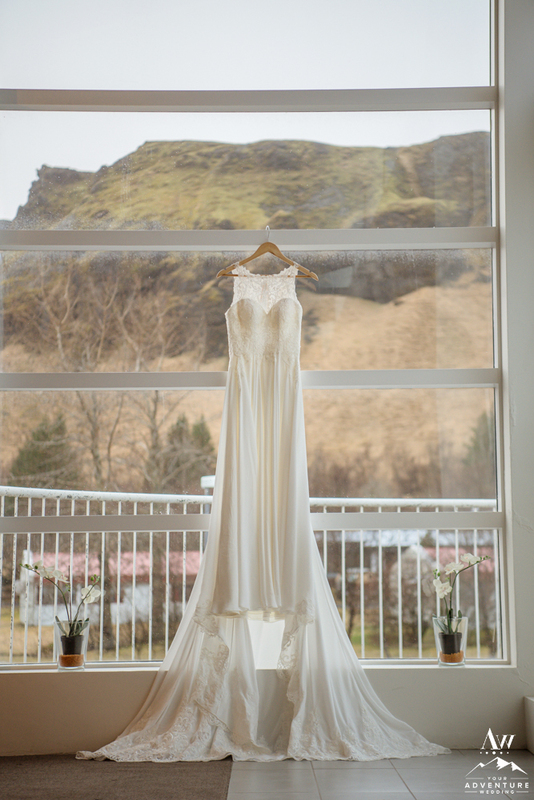 The Iceland wedding photographer was super excited to capture all of the details too! 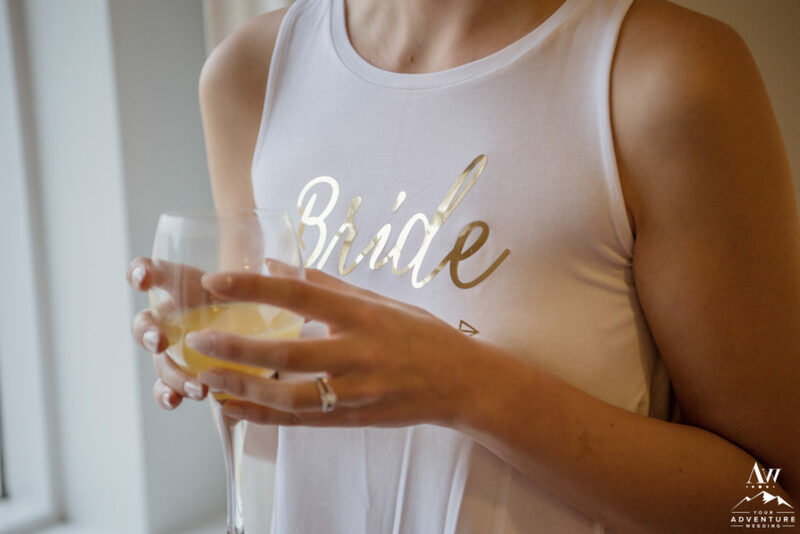 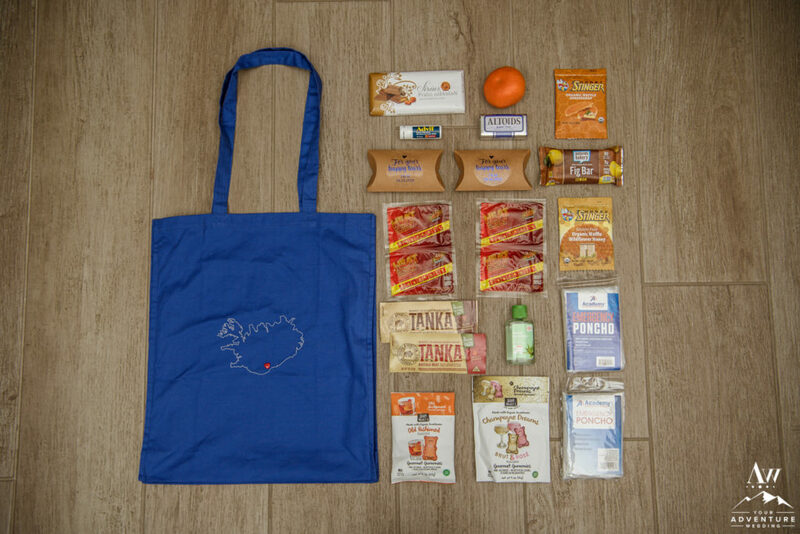 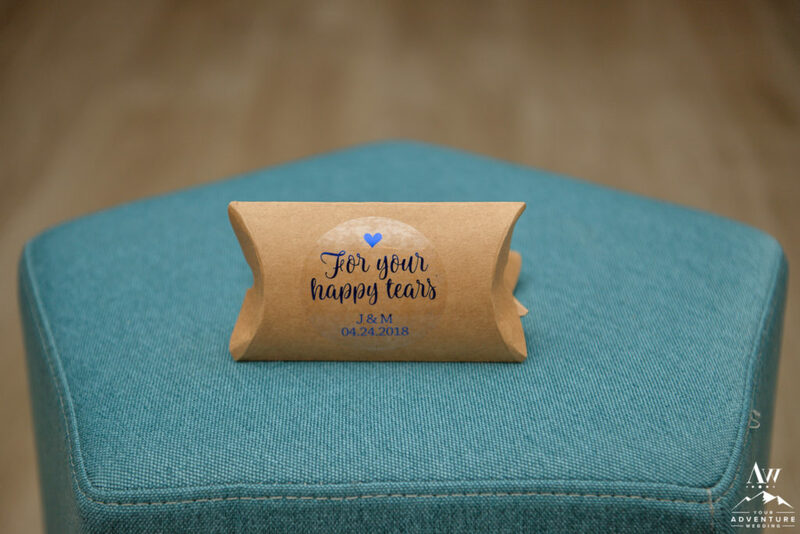 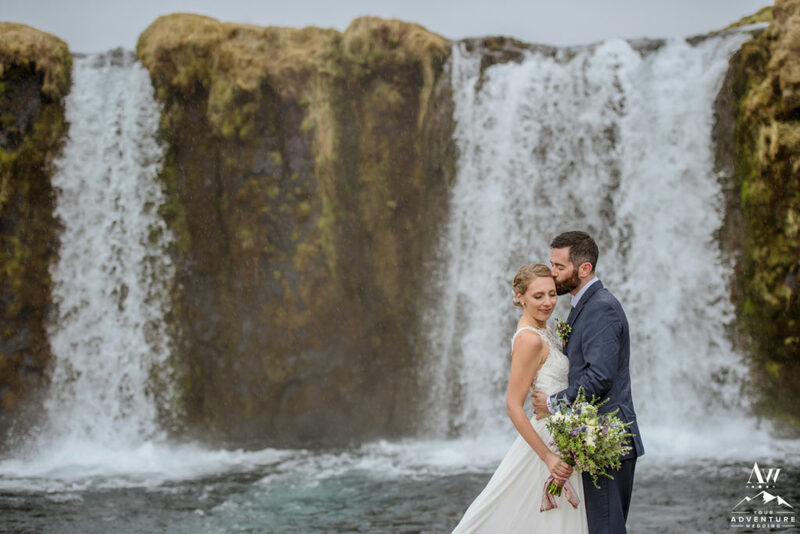 From welcome bags to the “Happy Tears” tissues, Jacalyn had thought of everything with our Iceland Wedding Planner teams expertise! 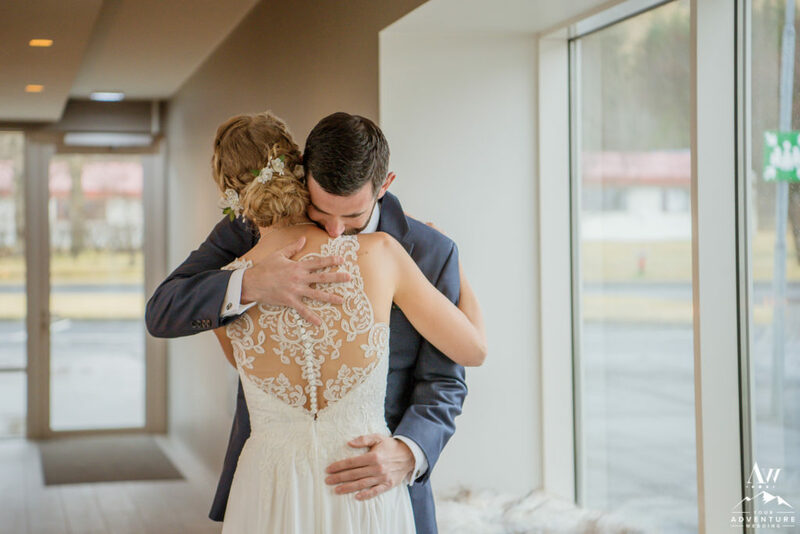 Before loading into the super jeep, these two shared a quick and intimate first look too! 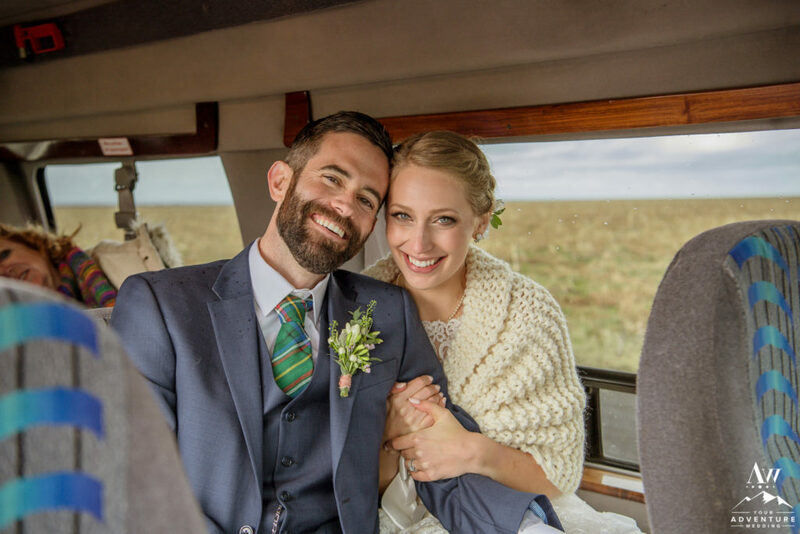 The excitement inside of the super jeep was brimming! 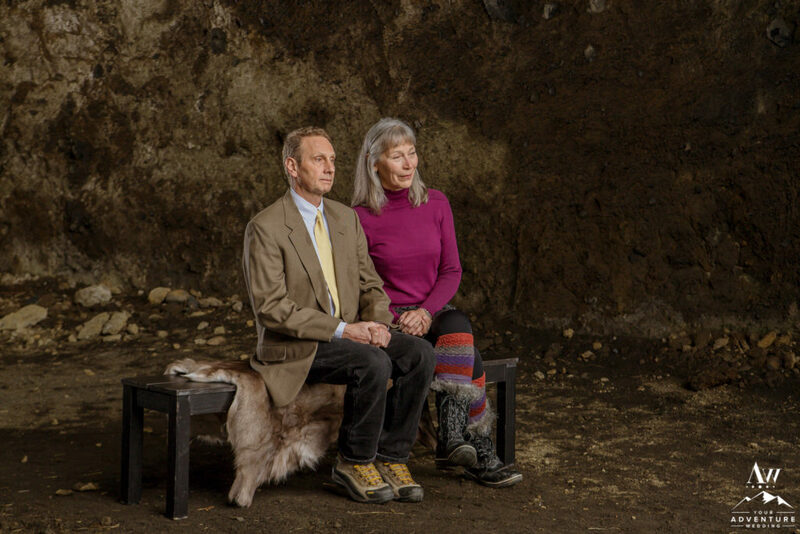 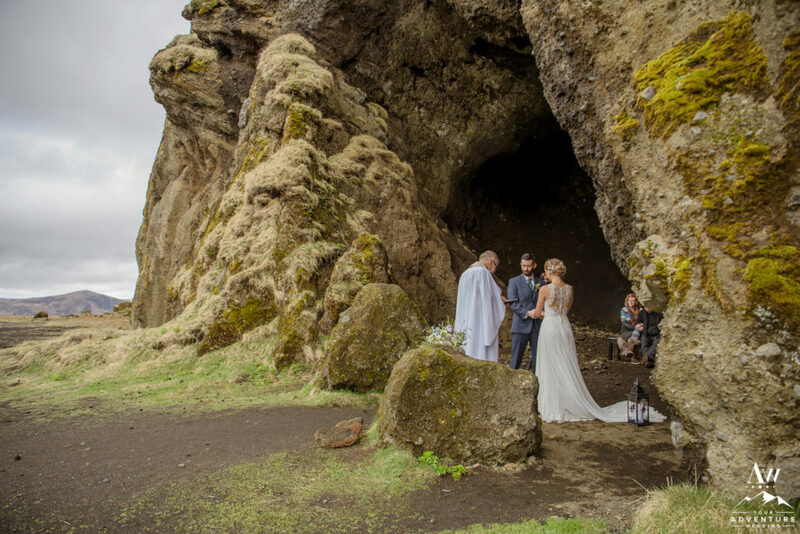 These two could not wait to get married inside of cave in Iceland (since one of their passions is caving) with both of their parents by their side. 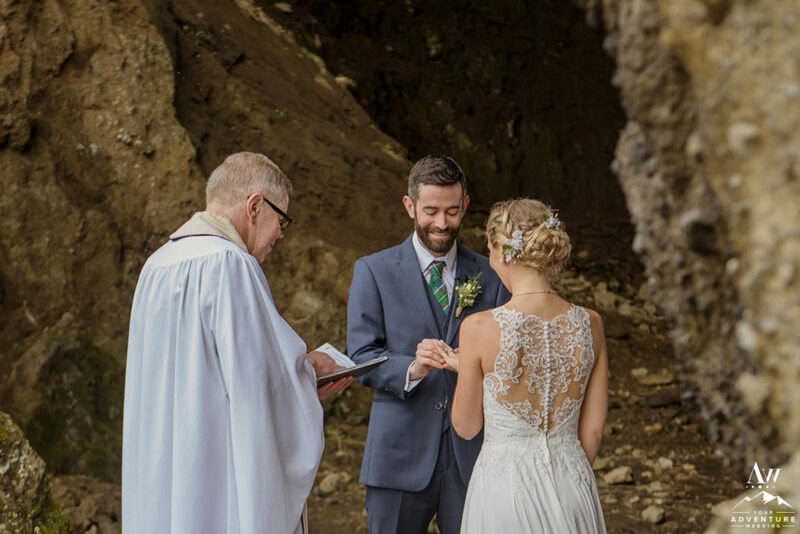 Our favorite Pastor crafted a very unique wedding ceremony for them to experience and Jacalyn and Michael exchanged their own vows and rings. 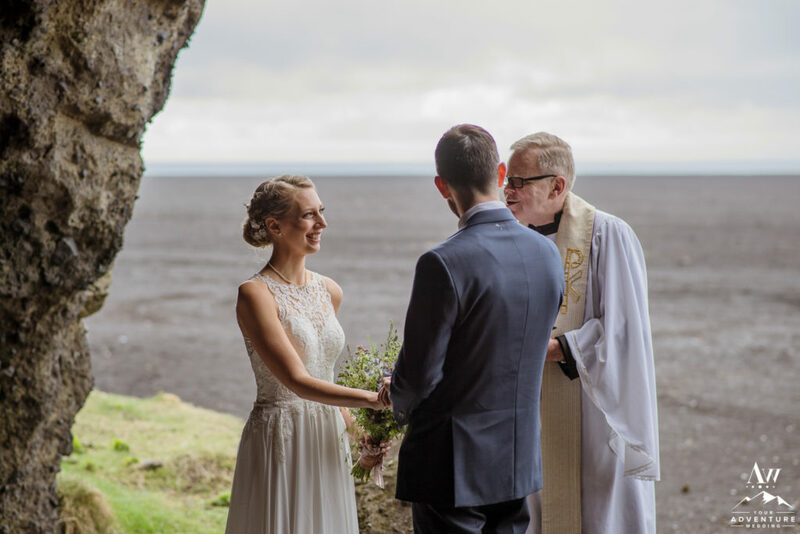 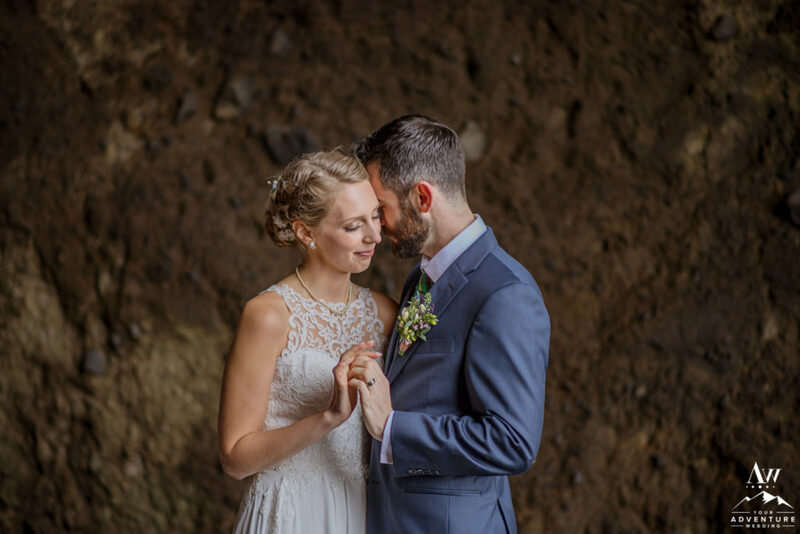 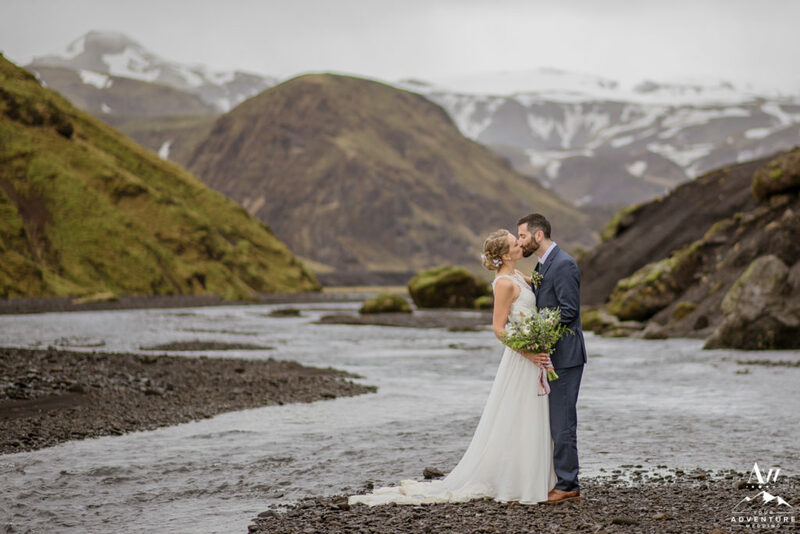 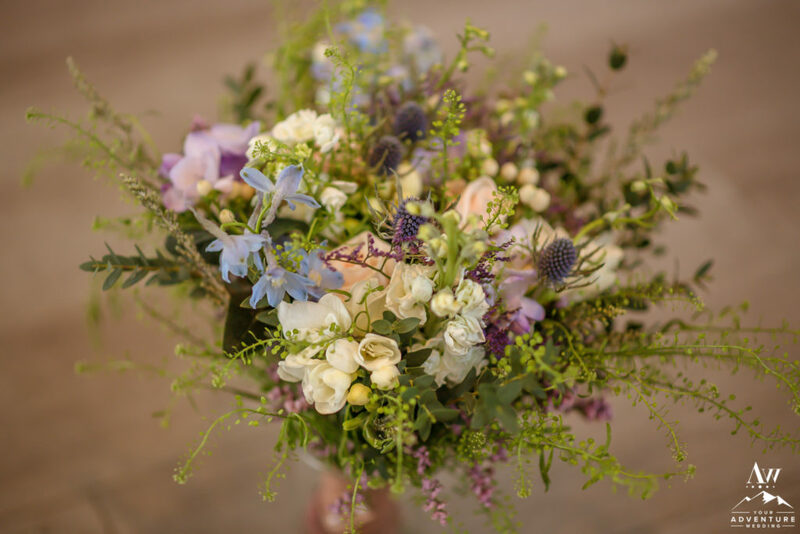 Such a lovely start to their Southern Iceland wedding adventure! 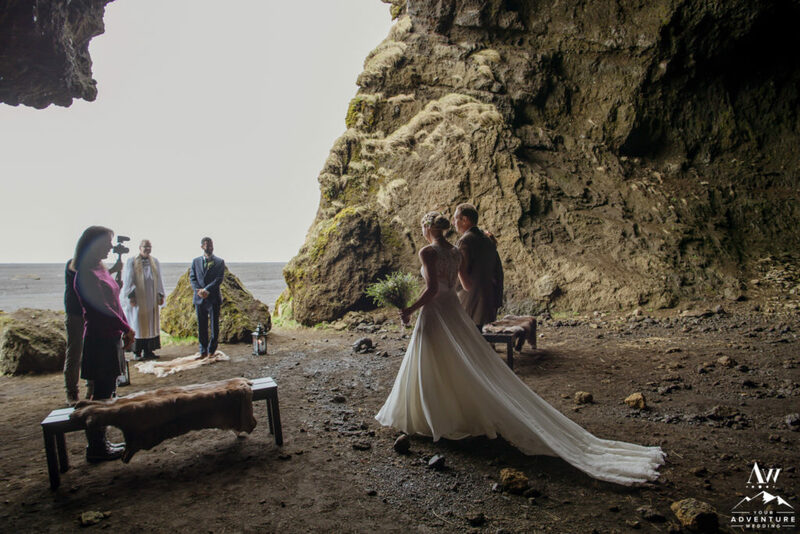 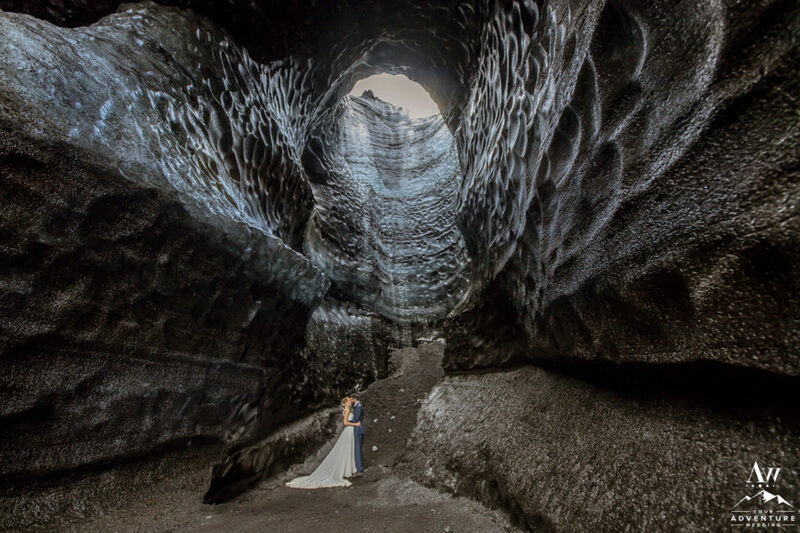 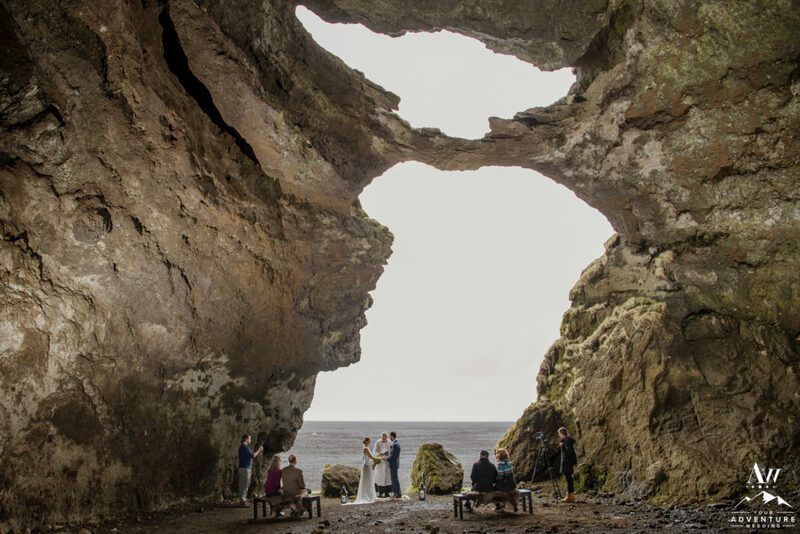 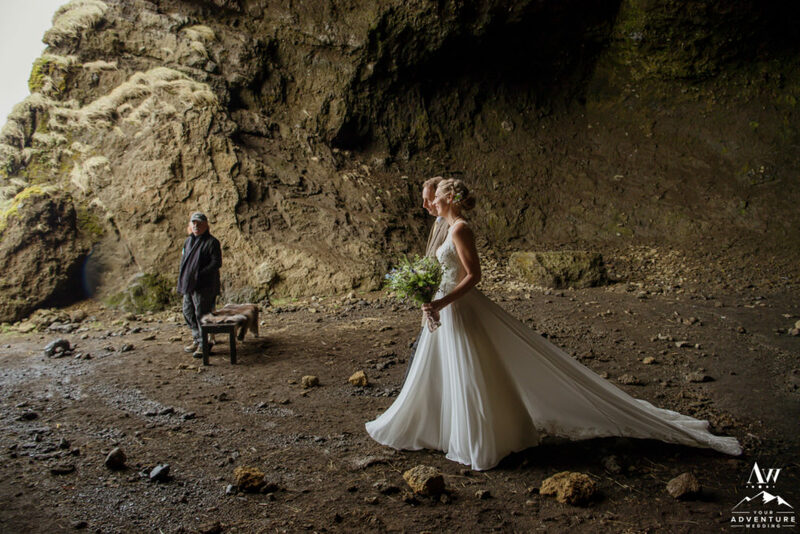 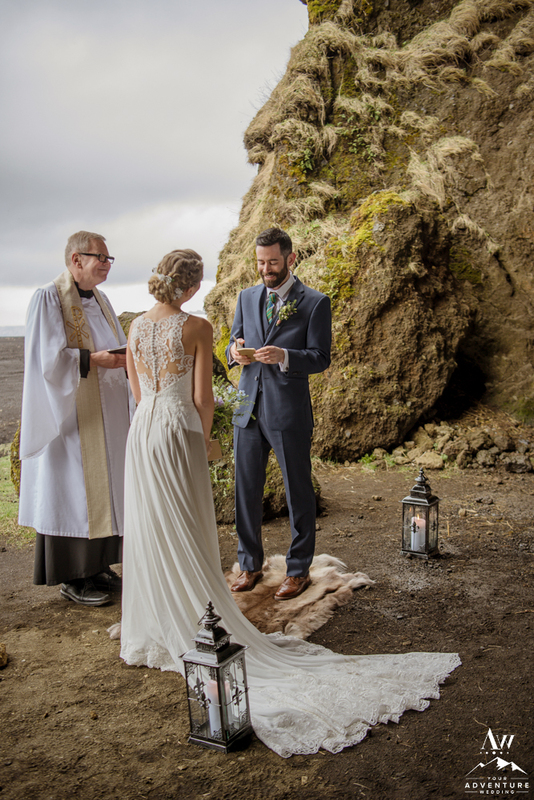 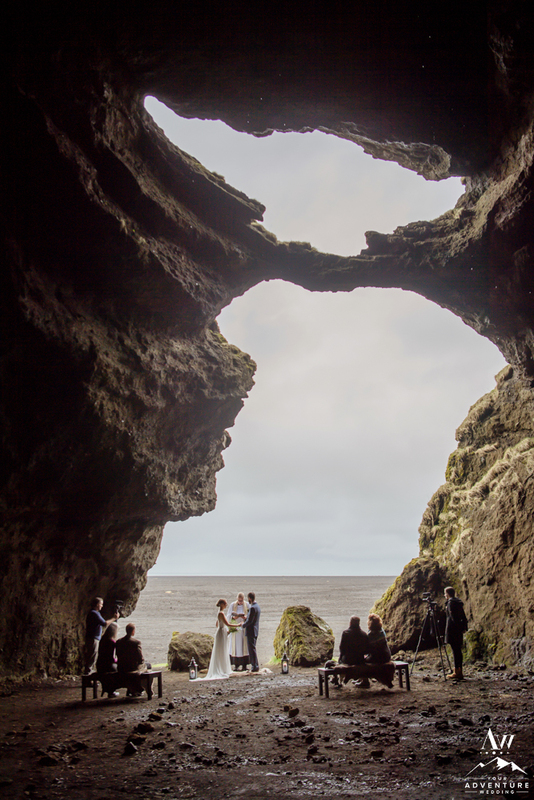 Having your Southern Iceland wedding adventure photos taken in a natural cave is unique experience. 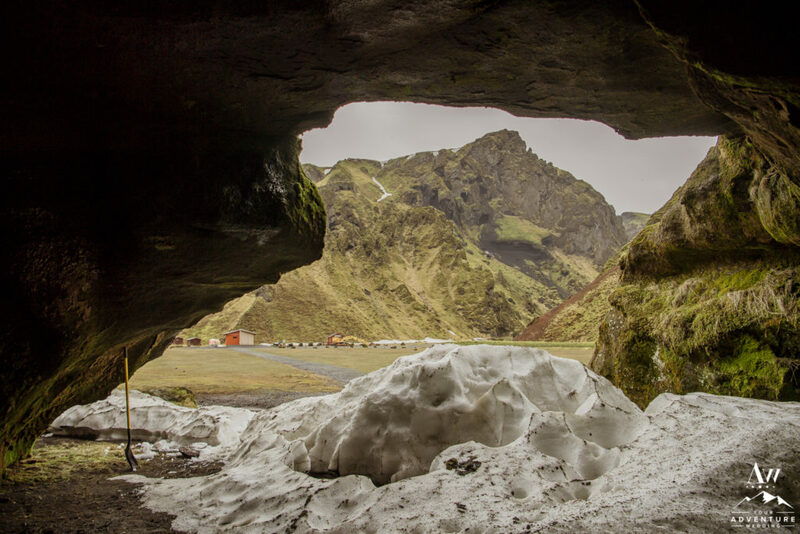 Many times you get sense of being a part of history, realizing how the cave was likely used to house people or animals away from the extreme weather conditions. 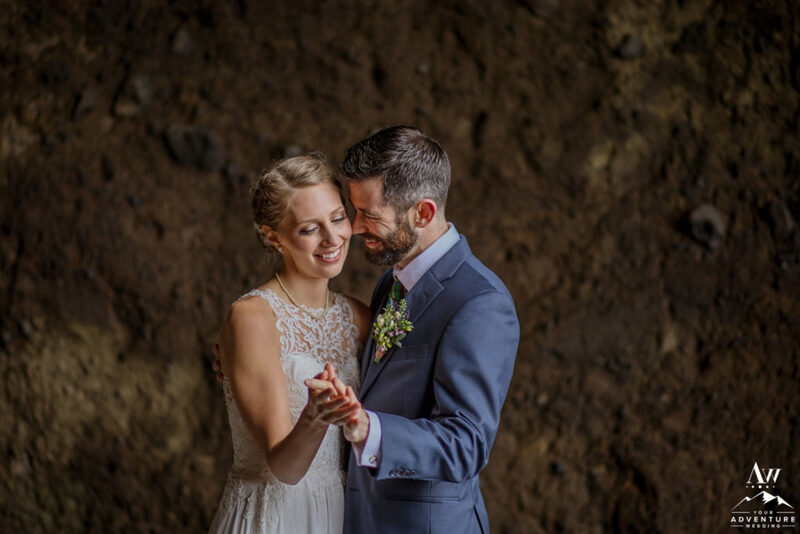 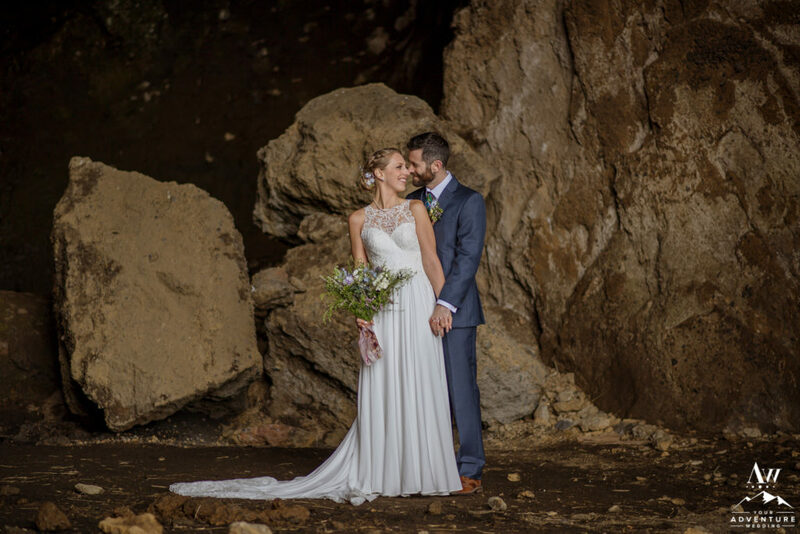 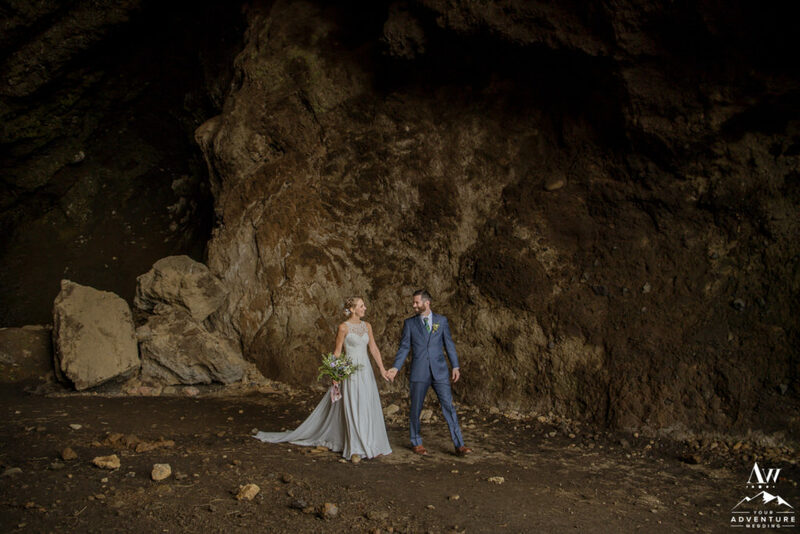 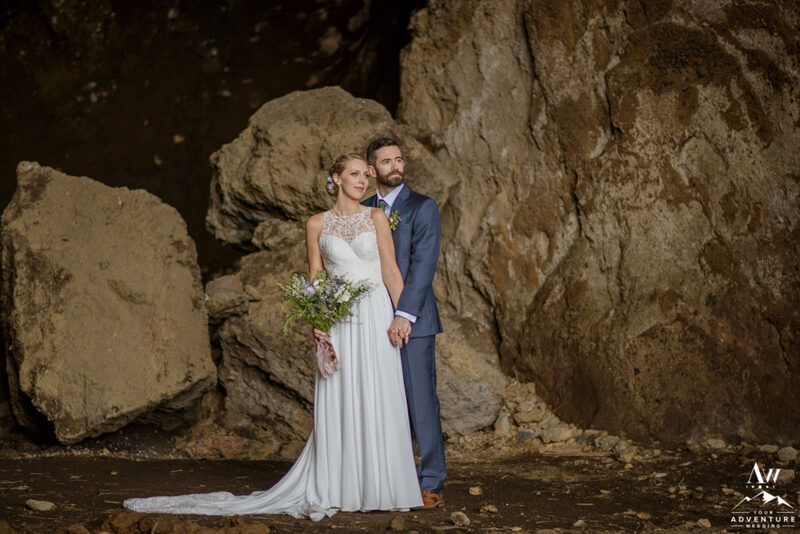 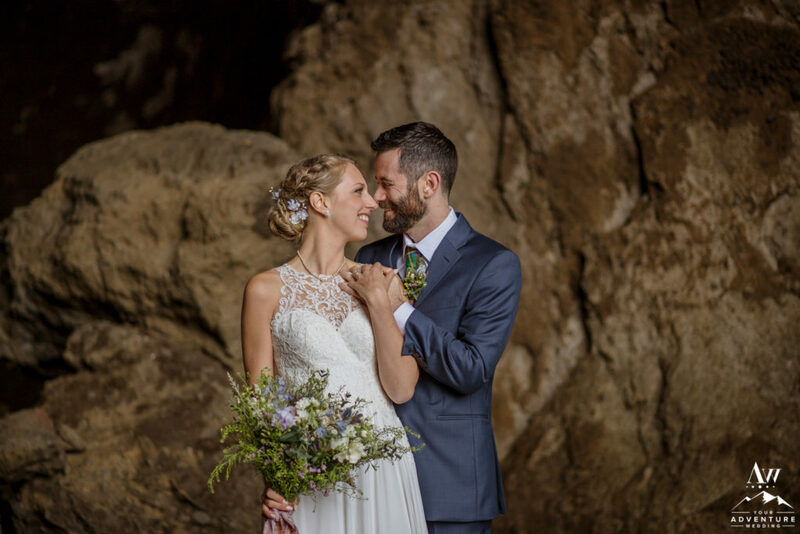 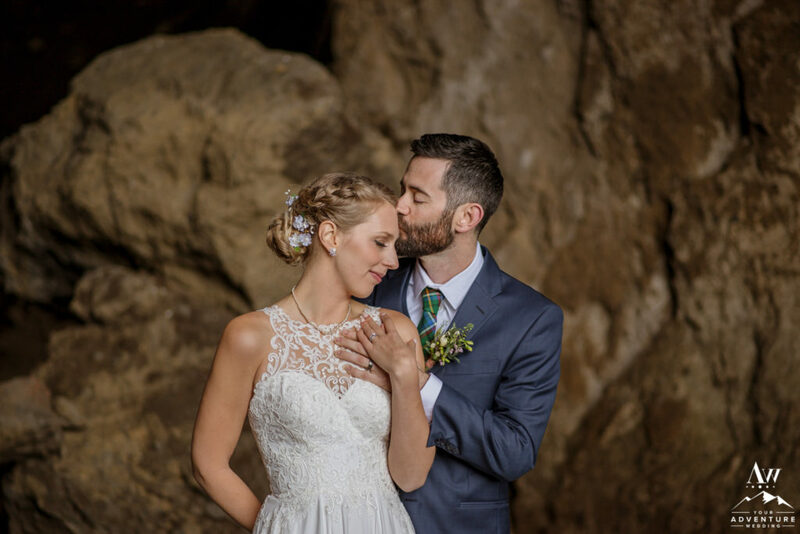 With Jacalyn and Michael also being interested in caving throughout their relationship they enjoyed having their intimate Iceland wedding photos taken in this beautiful natural cave! 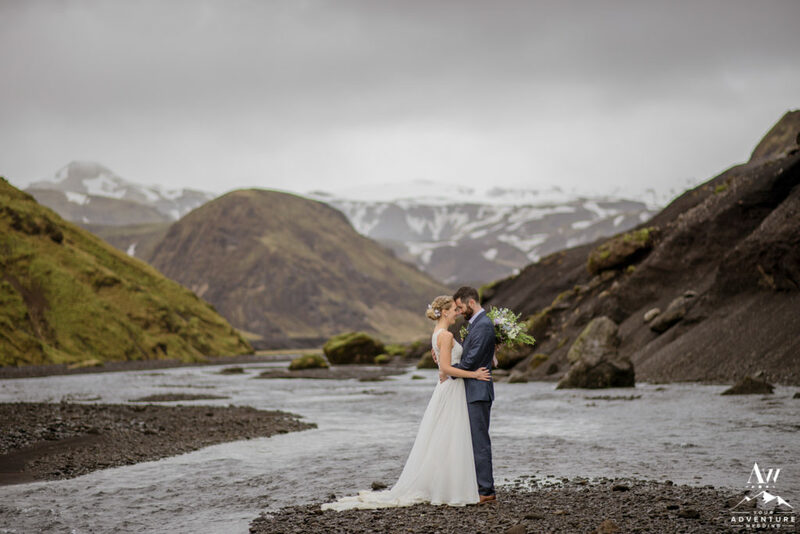 One of our Iceland wedding planning and photography team’s favorite things about the mountains in Iceland is although they are not very high, they shine with so much character in shape, tone and texture! 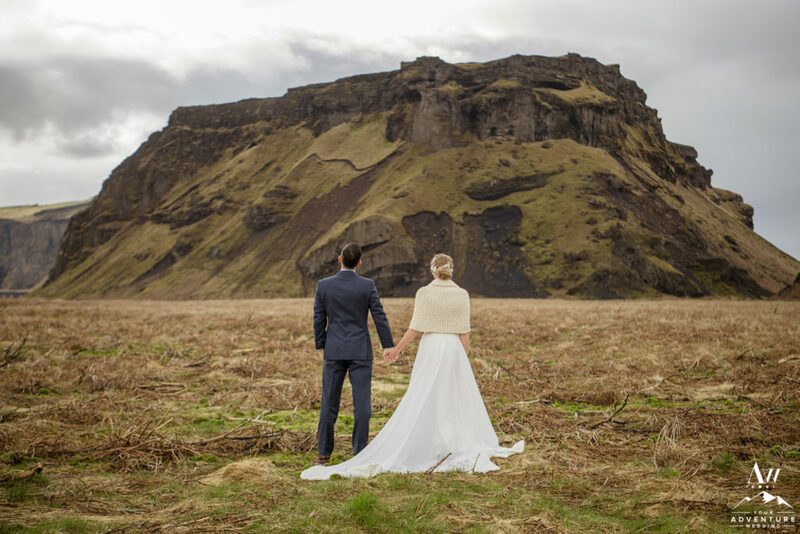 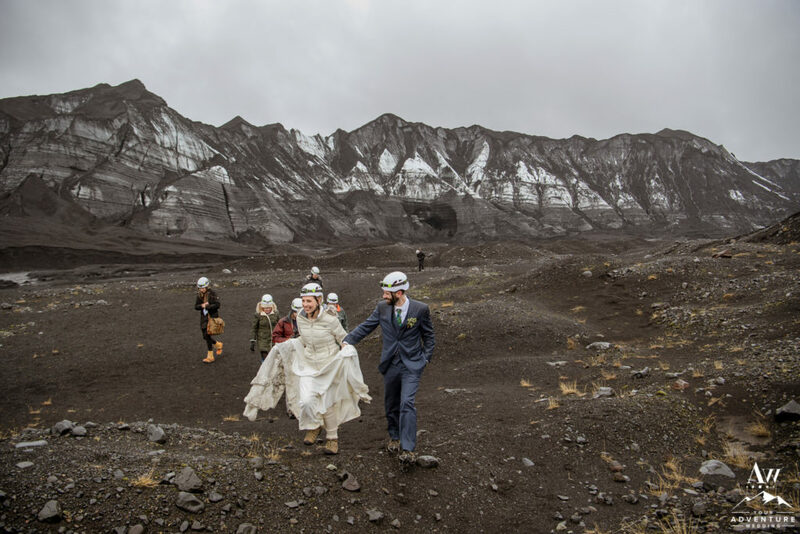 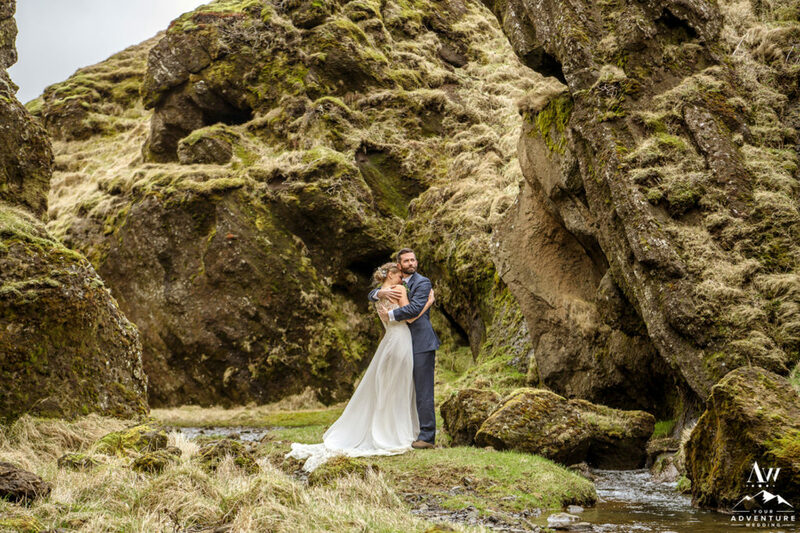 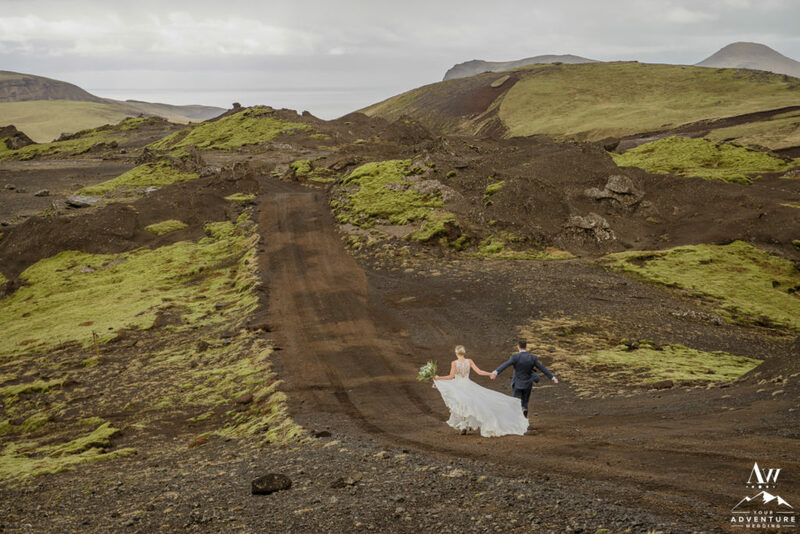 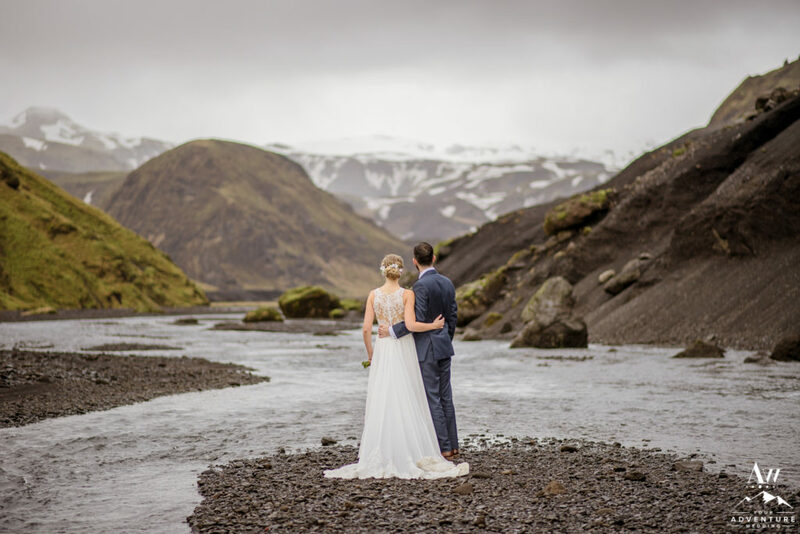 They more often than not make for such an ideal Iceland wedding photo shoot backdrop! 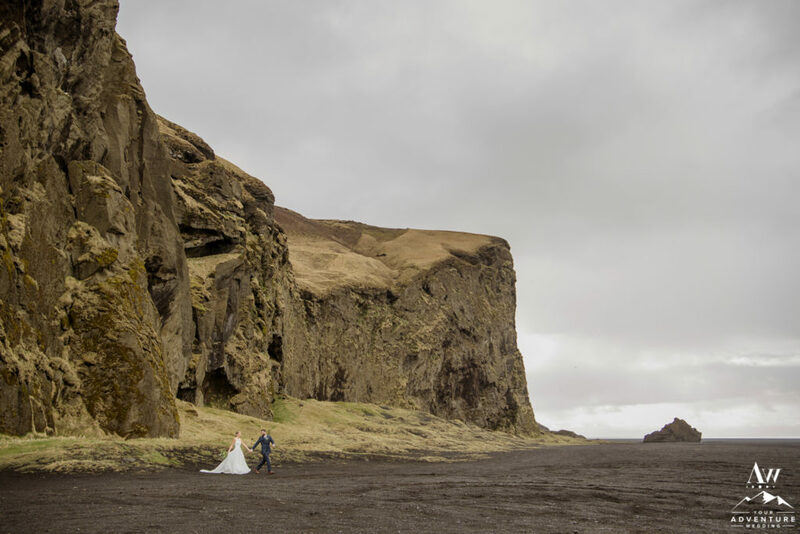 Game of Thrones is a show that many folks are addicted to watching so being able to actually explore the real life places the show was filmed in interesting to some adventure wedding clients. 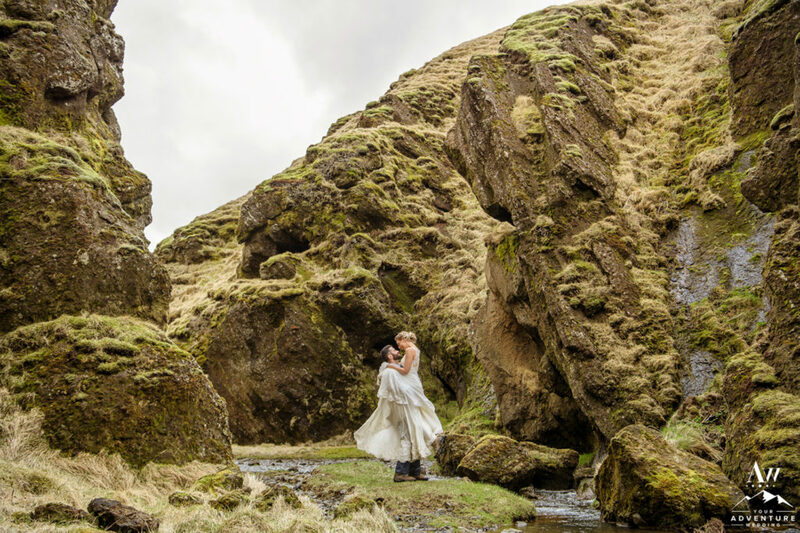 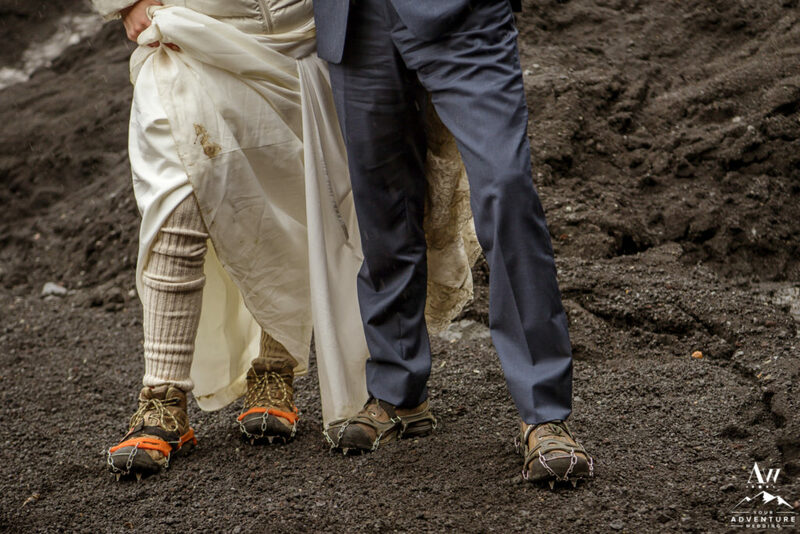 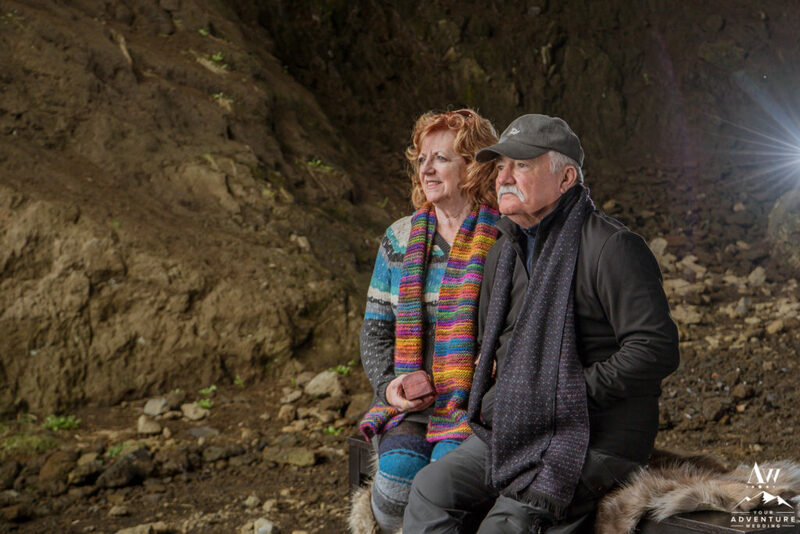 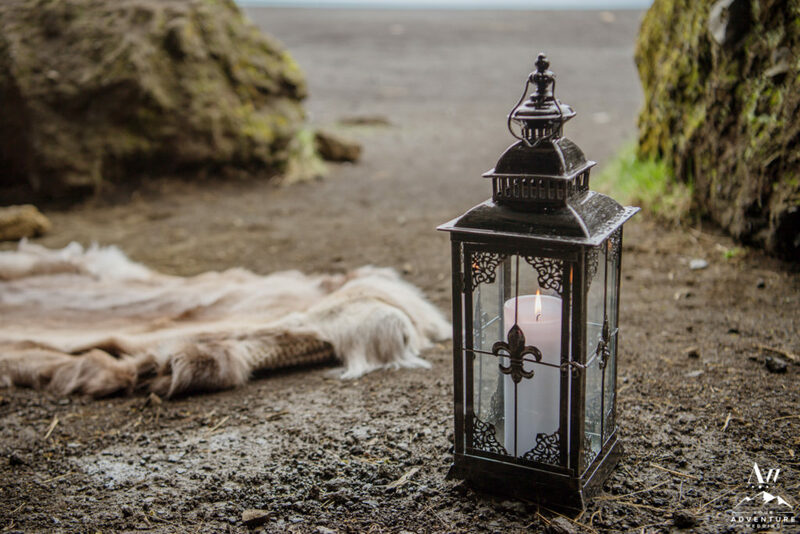 Jacalyn, Michael, and their guests were intrigued to journey to one of the areas character John Snow ventured through and oh boy did they look amazing during their wedding photos in Iceland! 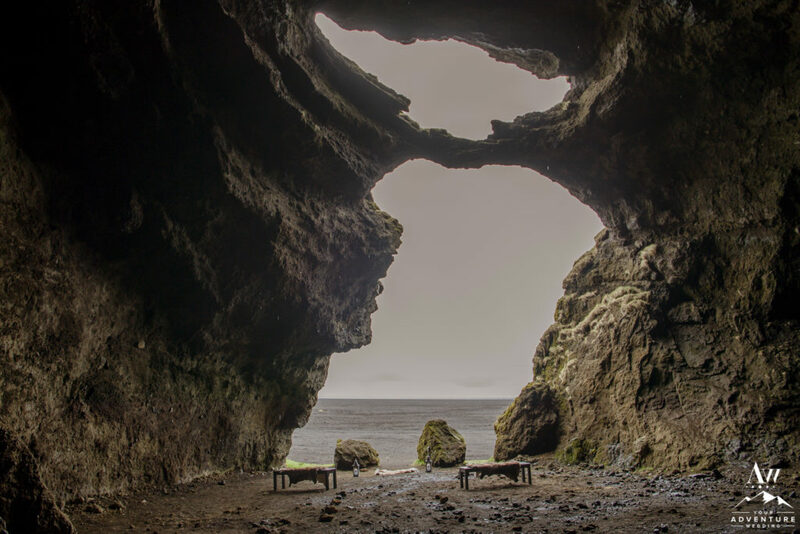 Planning a picnic lunch in a cave is always a fantastic idea rain or shine. 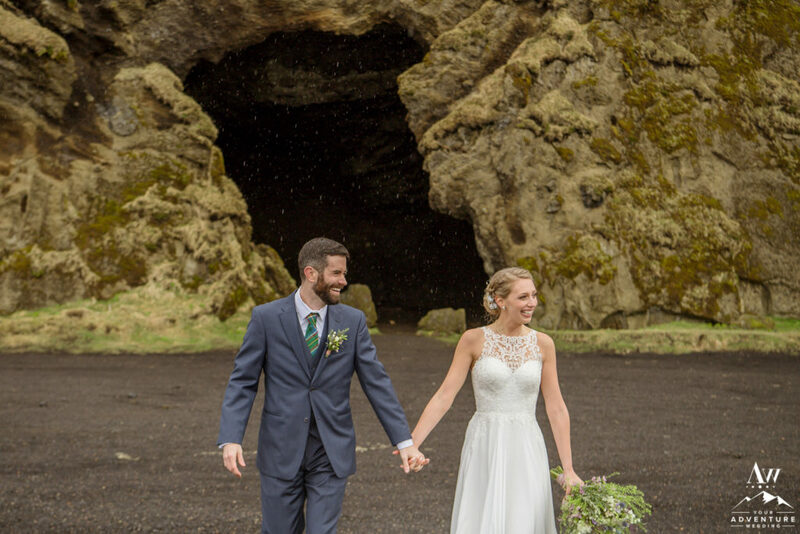 In Jacalyn and Michael’s case it shielded their group from experiencing a freak serious hail / sleet storm! 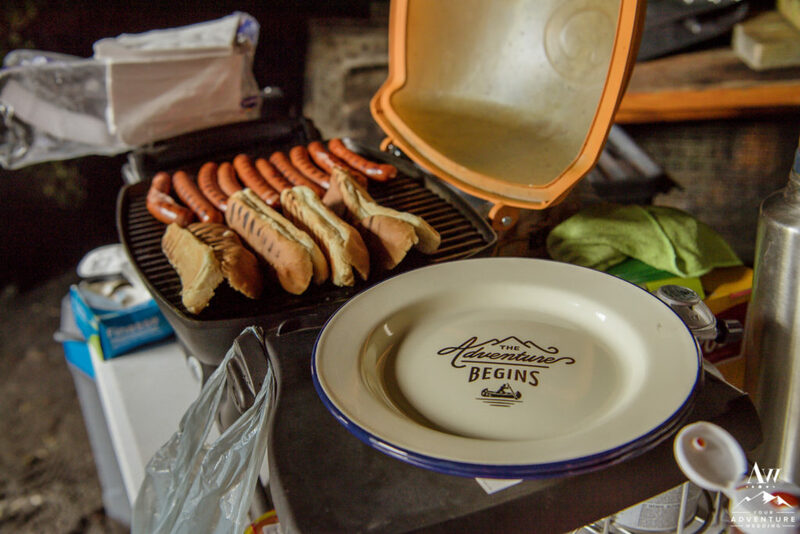 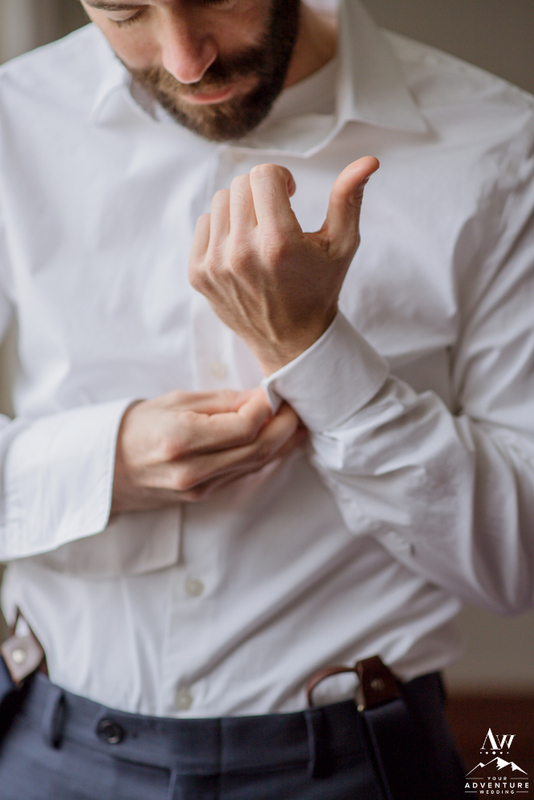 Not to mention that having a hot meal (AKA, Traditional hot dog bbq) is always a great option so that you catch a second wind despite the weather becoming challenging. 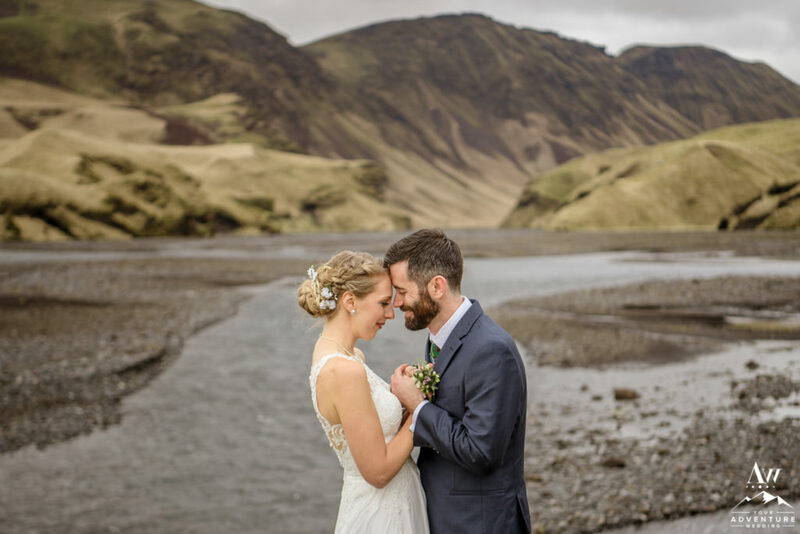 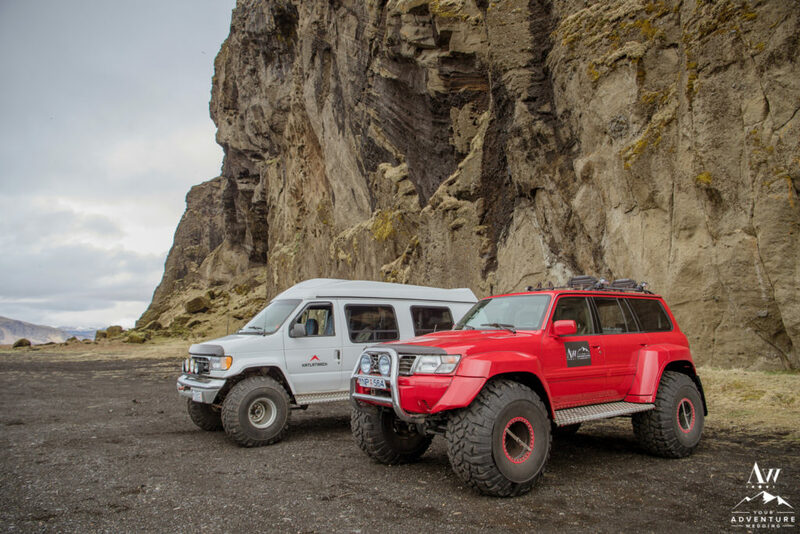 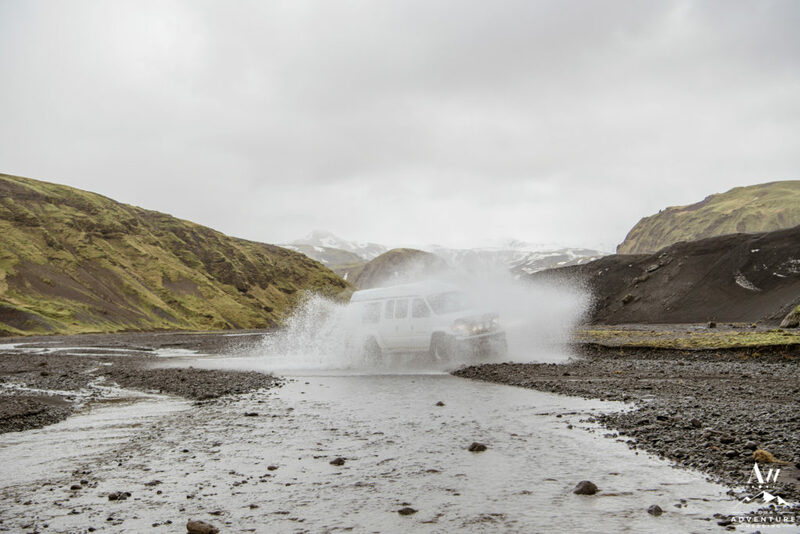 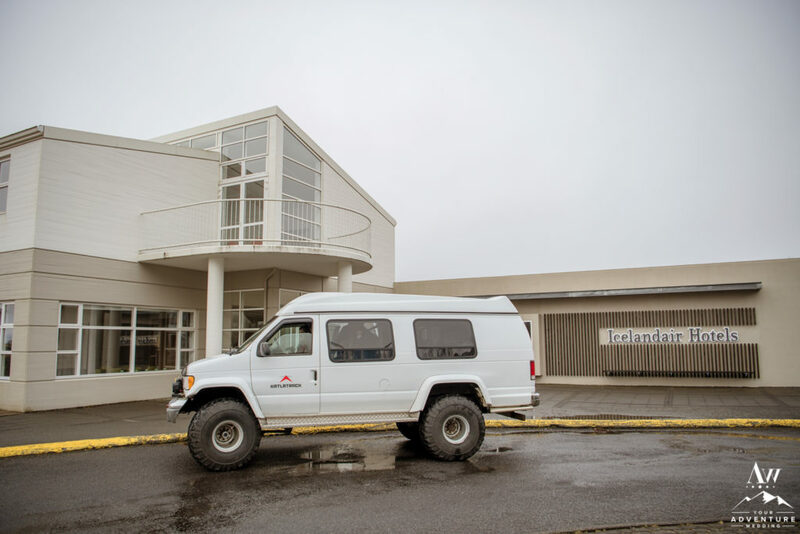 It can really make a huge difference in the attitude and the momentum of Southern Iceland wedding adventure! 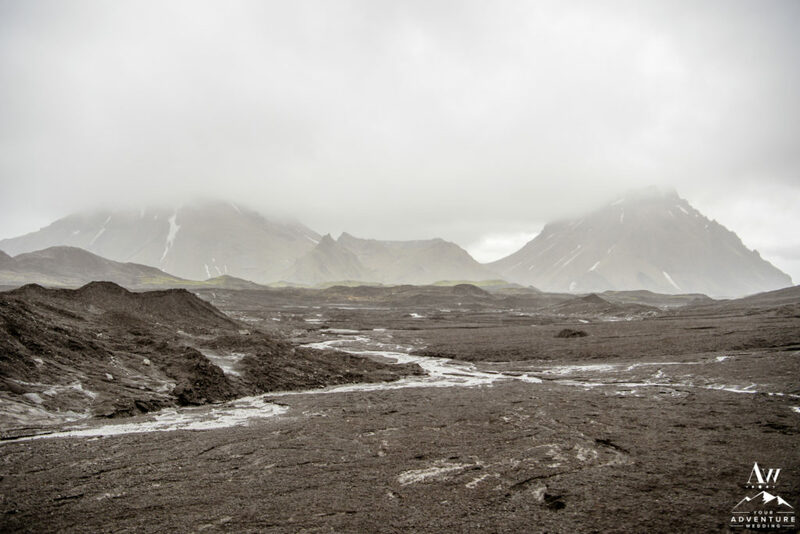 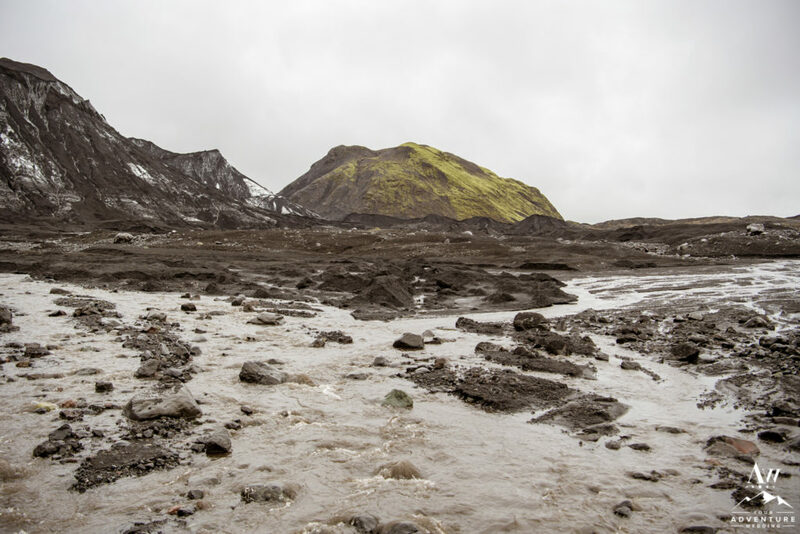 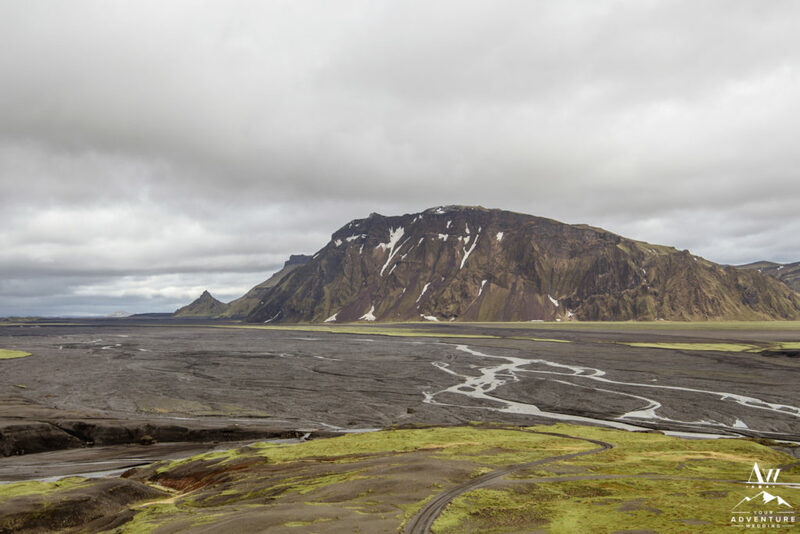 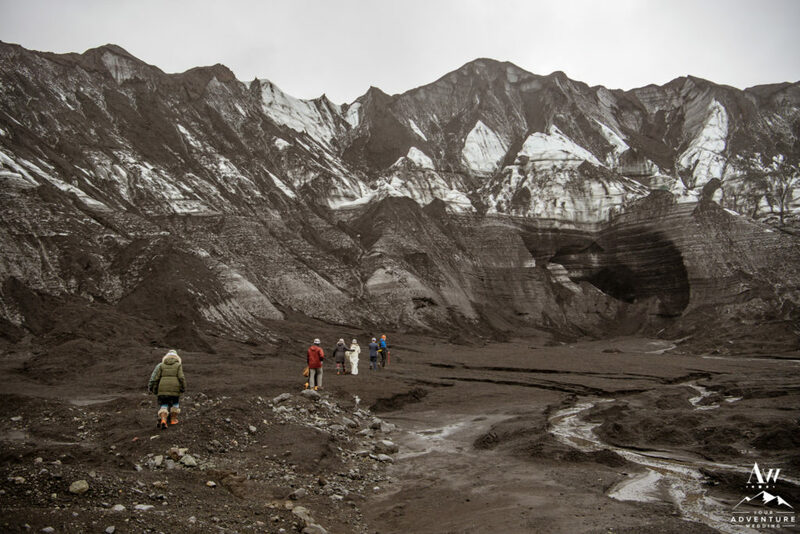 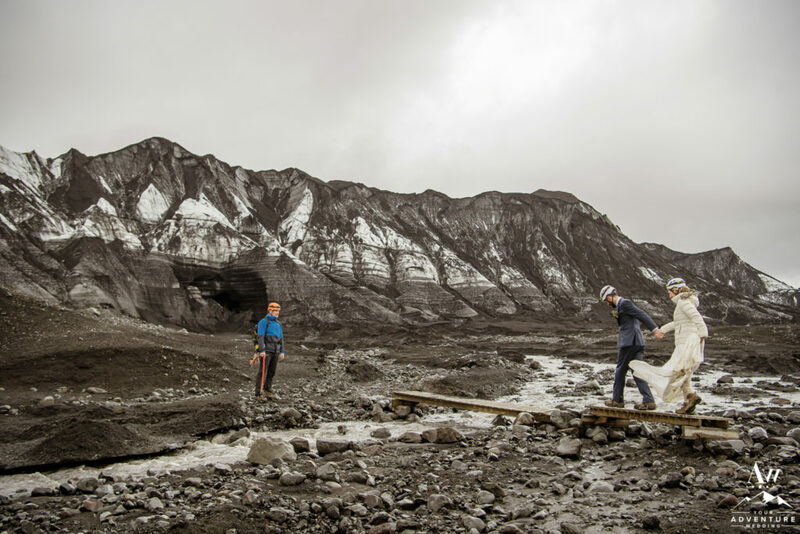 There are not many black glaciers in the world to visit, but Iceland has a few of their 13 glaciers that are black because of crazy amount of sand and pumice from previous eruptions. 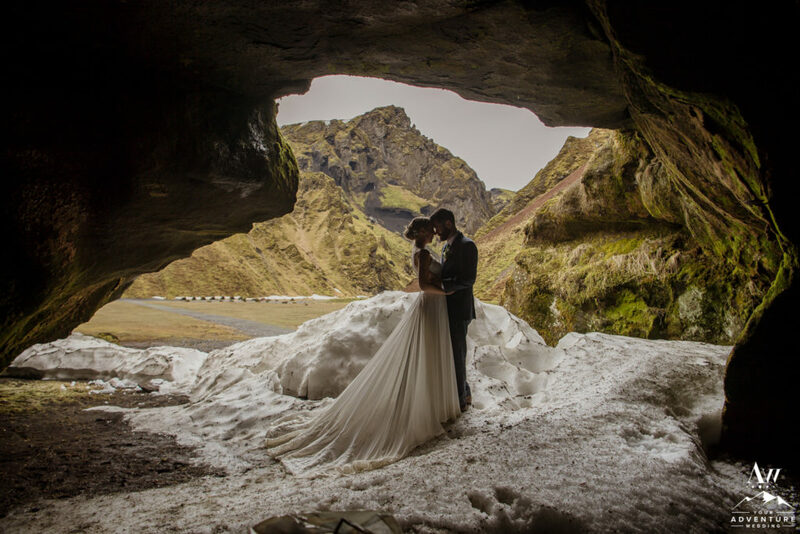 No Southern Iceland wedding adventure would be complete without a visit to a glacier. 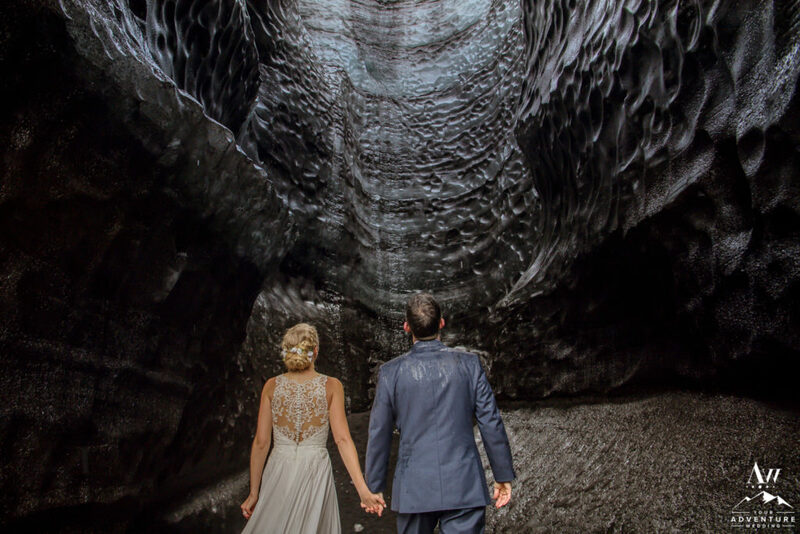 Our clients always seem to get lucky to with being able to explore unique ice caves while there! 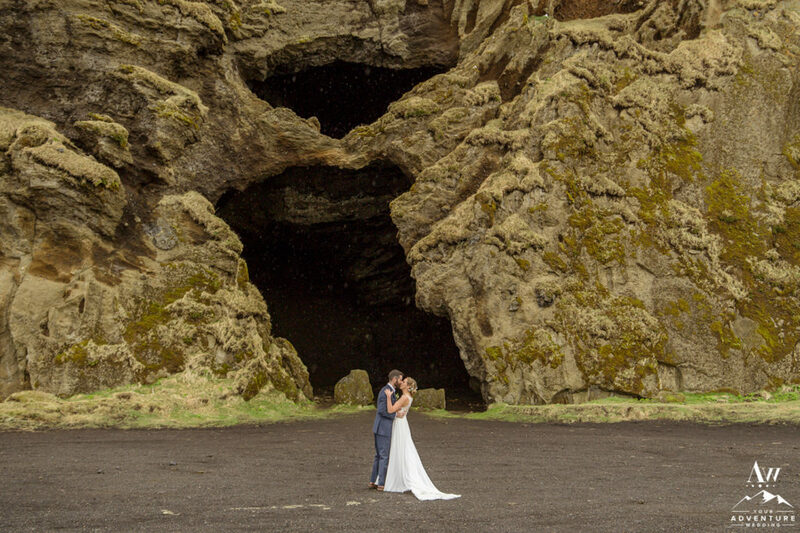 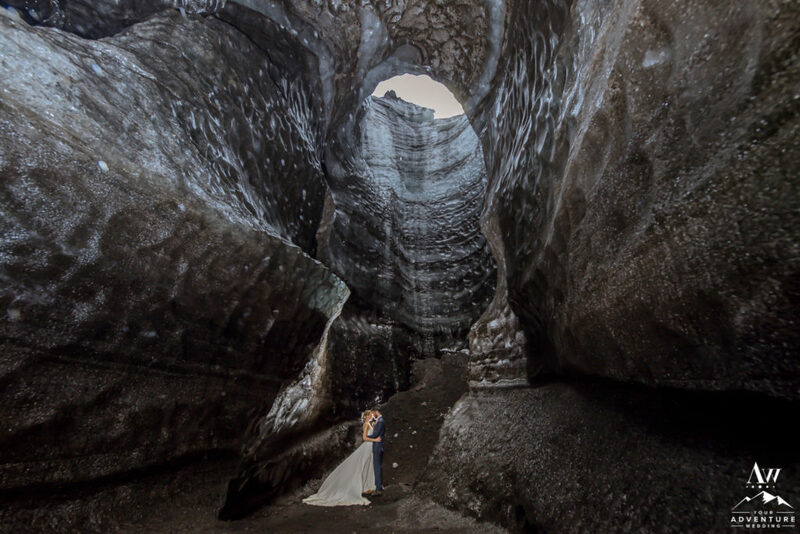 Pretty sure Jacalyn and Michael’s jaws dropped on the floor as they entered the cave for their Iceland wedding photos! 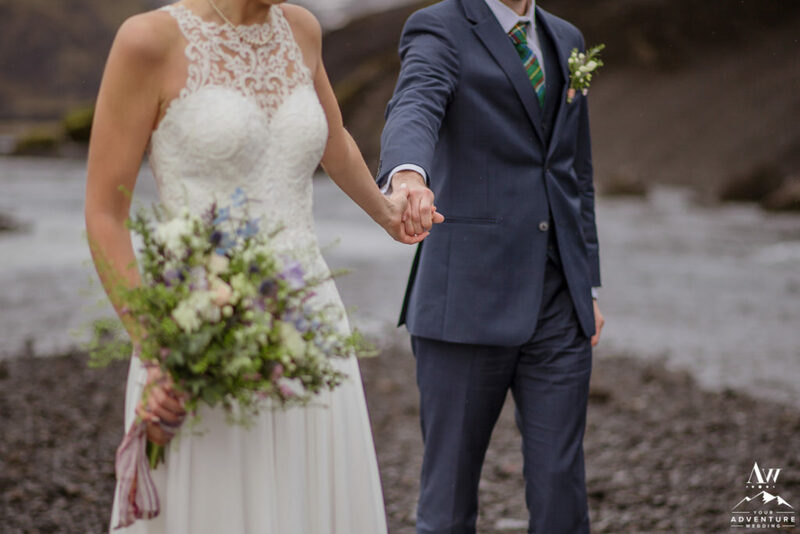 The colors went from black to white, and hints of blue, it was really intoxicating! 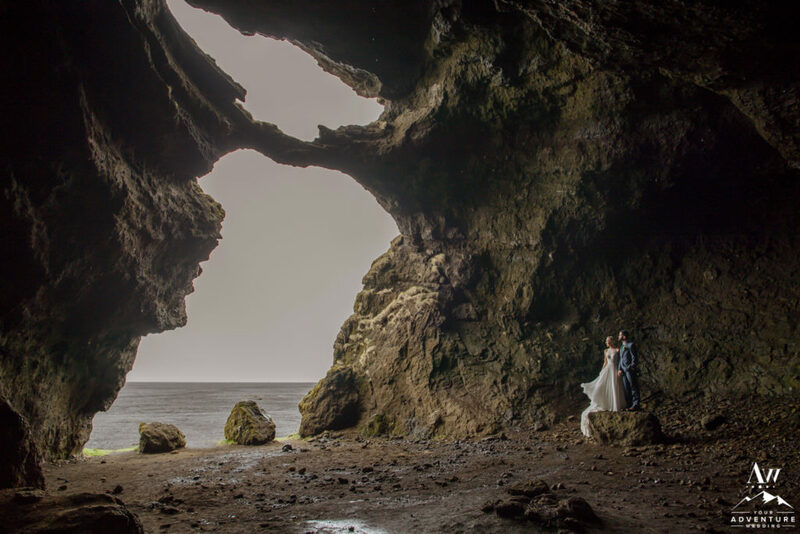 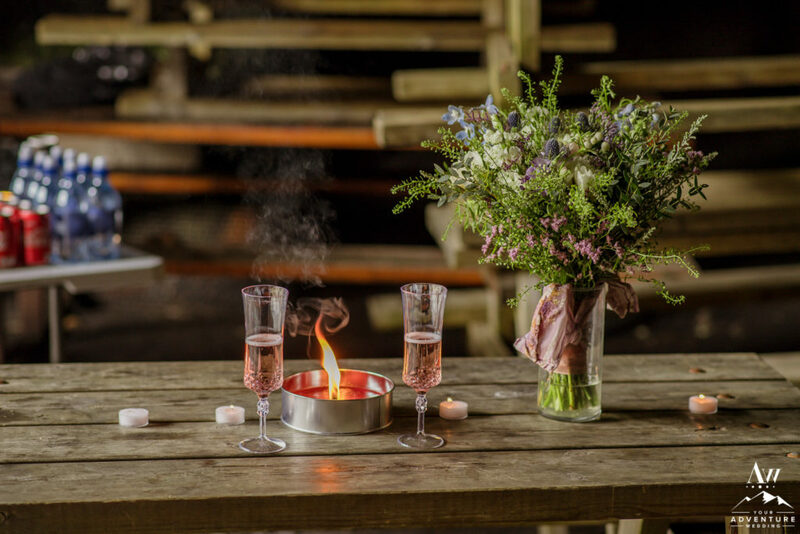 Hiring an adventurous wedding photographer in Iceland can be a tricky decision if looking outside of our Iceland Wedding Planner team. 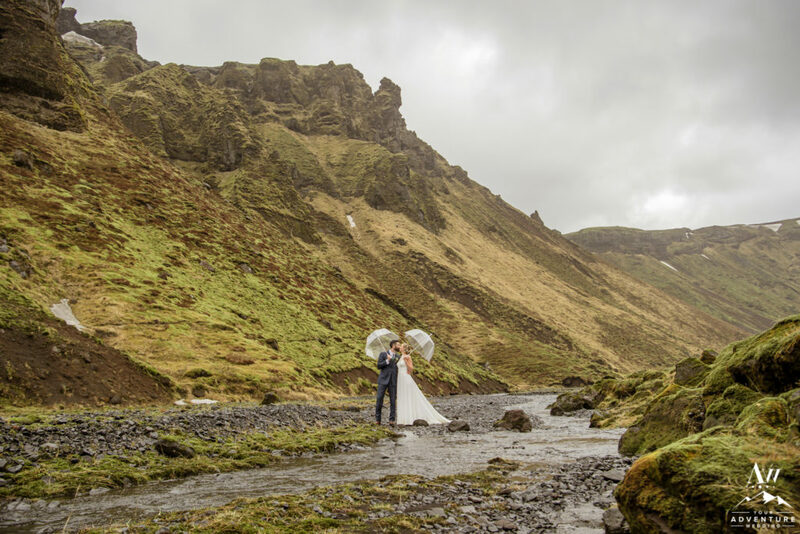 Mainly because most adventure wedding photographers cannot properly prepare or endure the crazy weather conditions (IE, heavy rains, extreme gale force winds, hail/sleet, or blizzard like conditions) and still create magical Iceland wedding photos. 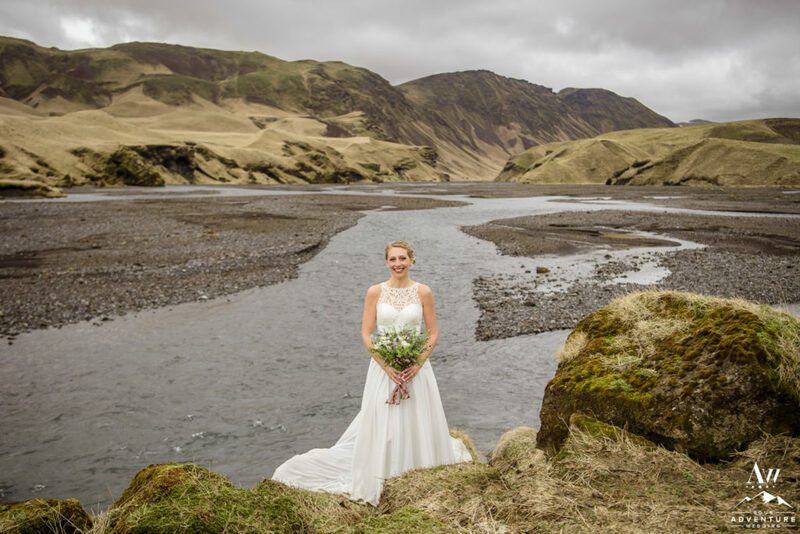 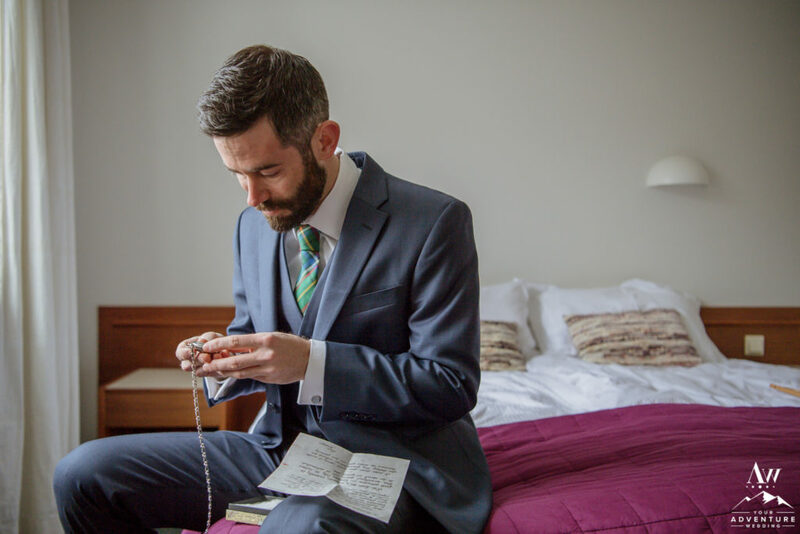 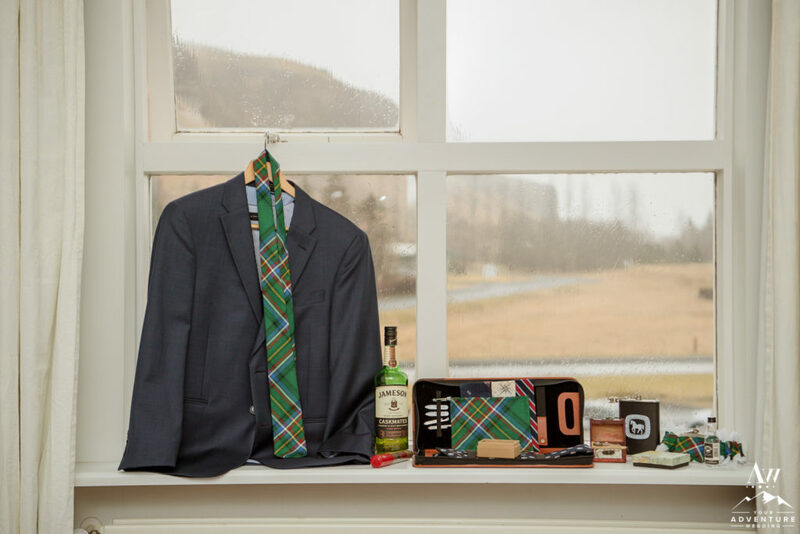 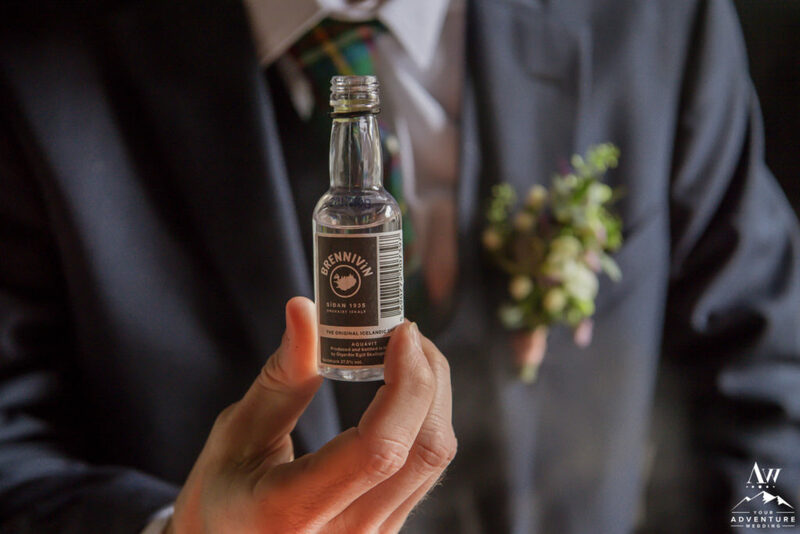 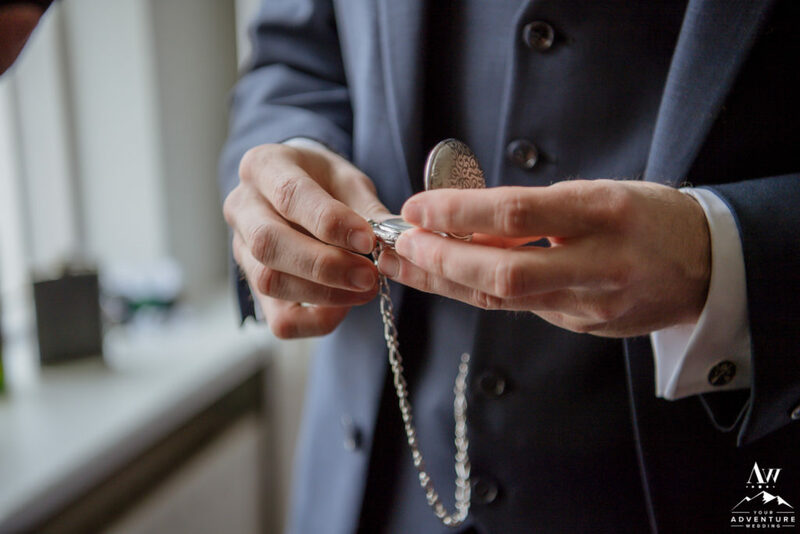 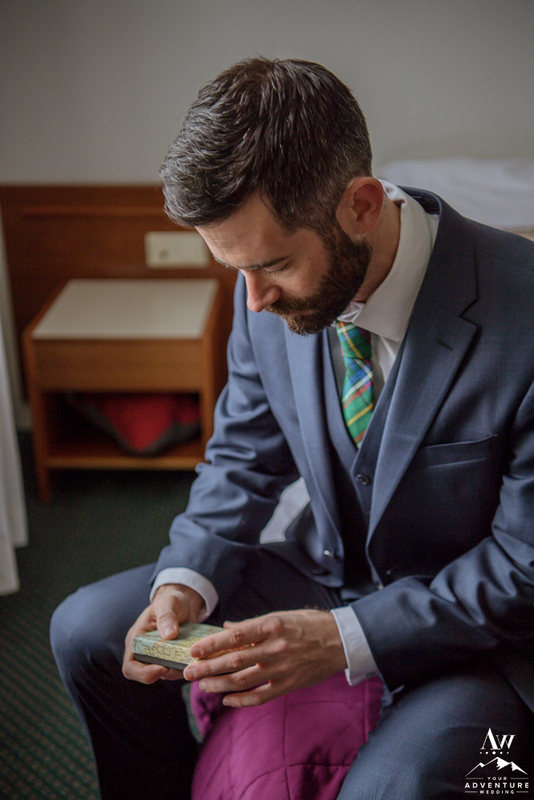 Our Iceland wedding photography team though, is always prepared and well versed. 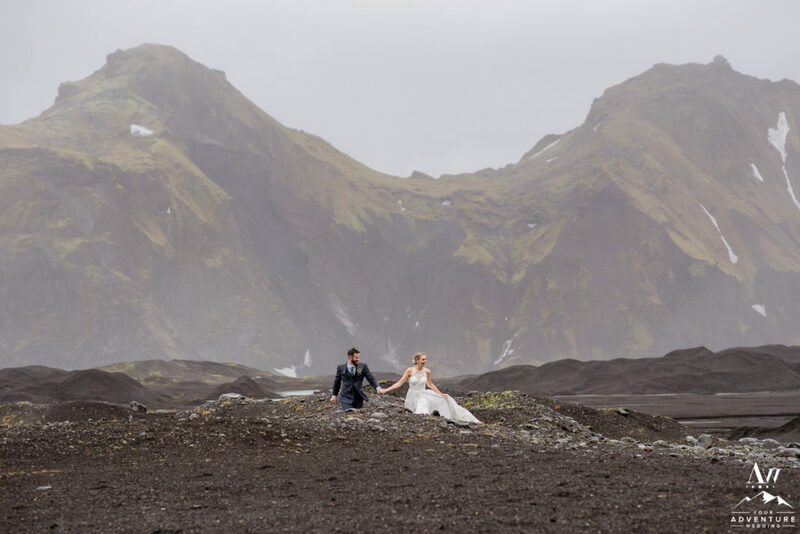 So when the weather turned on Jacalyn and Michael, they along with the photographer embraced it as a super fun part of the story that was being created! 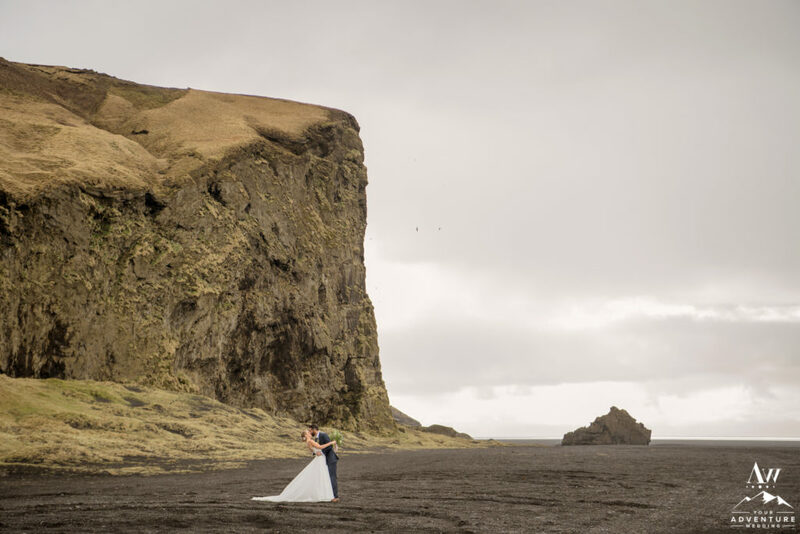 When you are planning an adventure wedding, it’s important to have a timeline with a good balance of exploration, time to mingle (if bringing guests), and to have epic Iceland wedding photos taken. 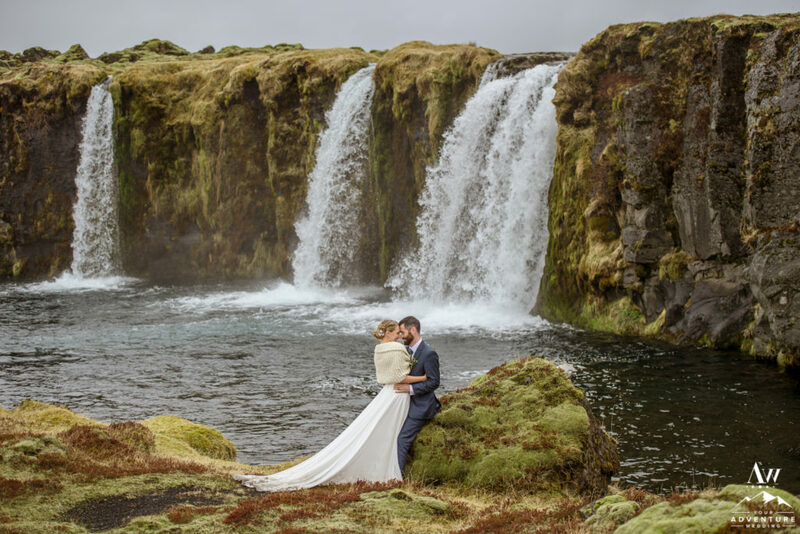 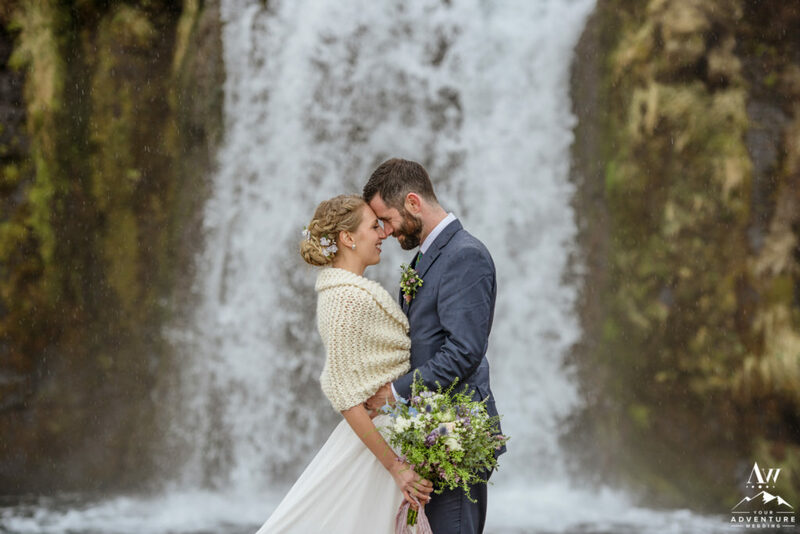 The next location on Jacalyn and Michael’s Southern Iceland wedding adventure was one of our many exclusively private waterfalls! 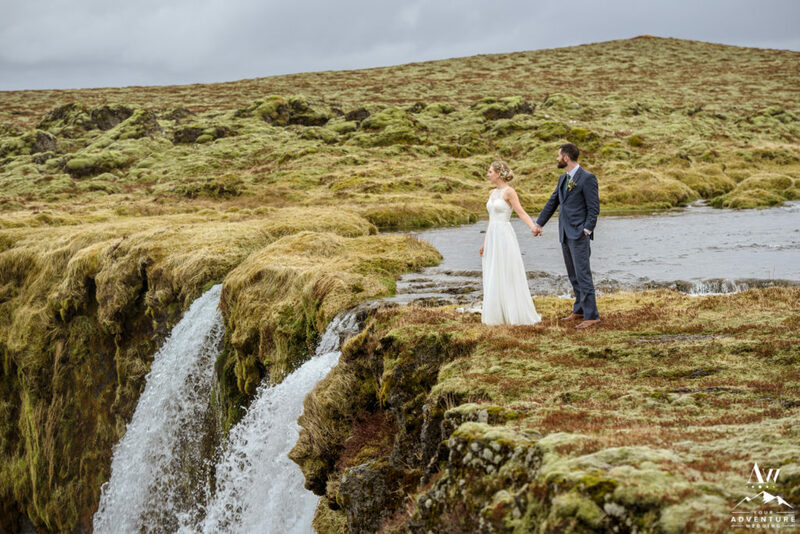 These two spent time exploring both the base of the waterfall and climbed on top for an endless view! 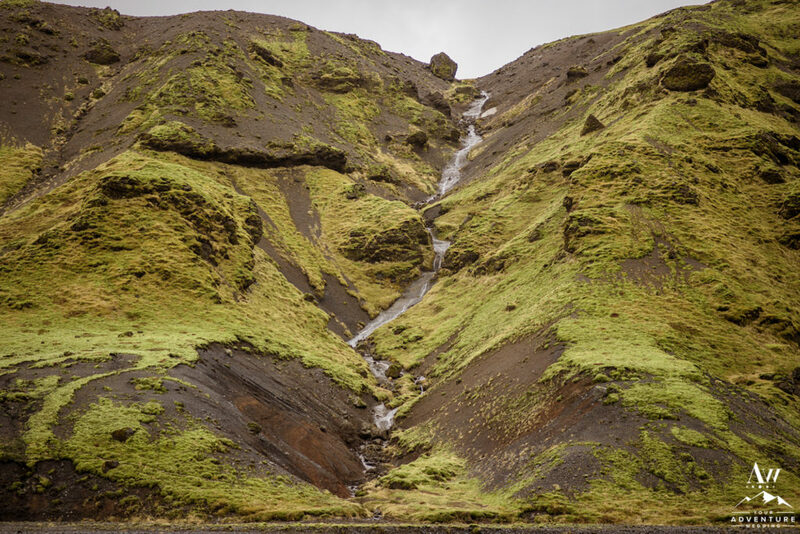 It’s amazing to see the power the waterfall exudes and to hear the sounds. 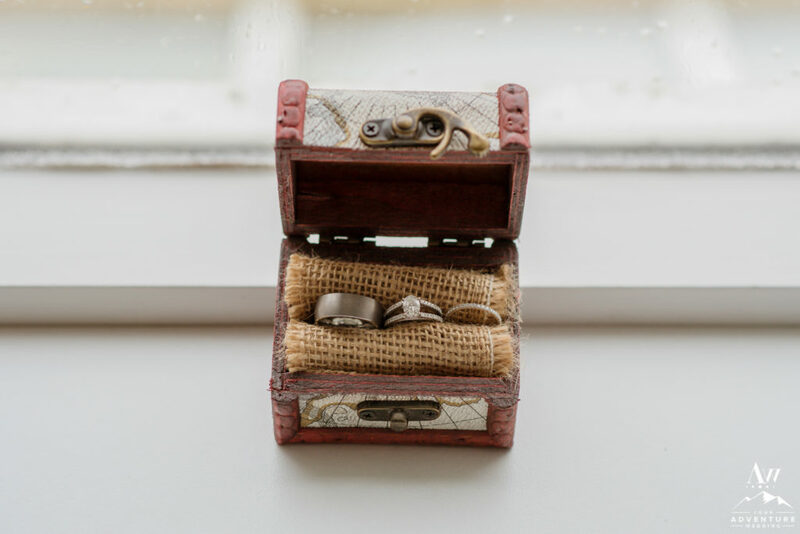 Bringing that memory home with you is way better than any silly souvenir! 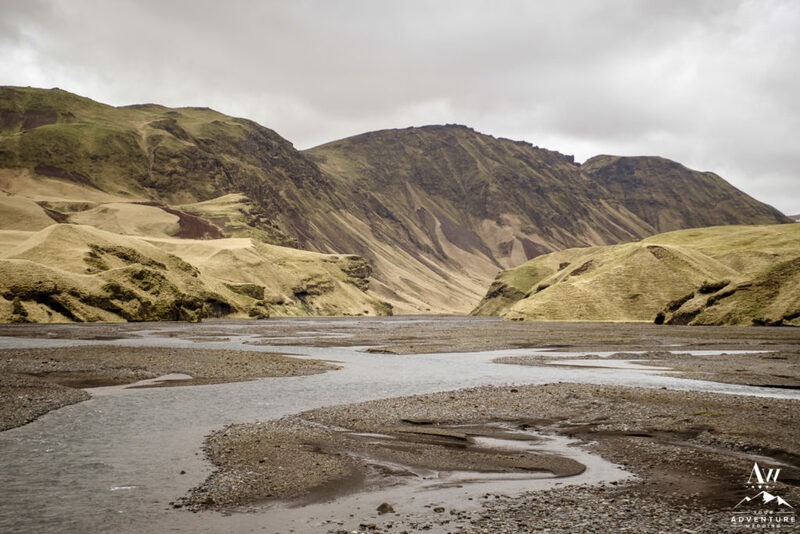 Canyons are typically created when a glacier recedes. 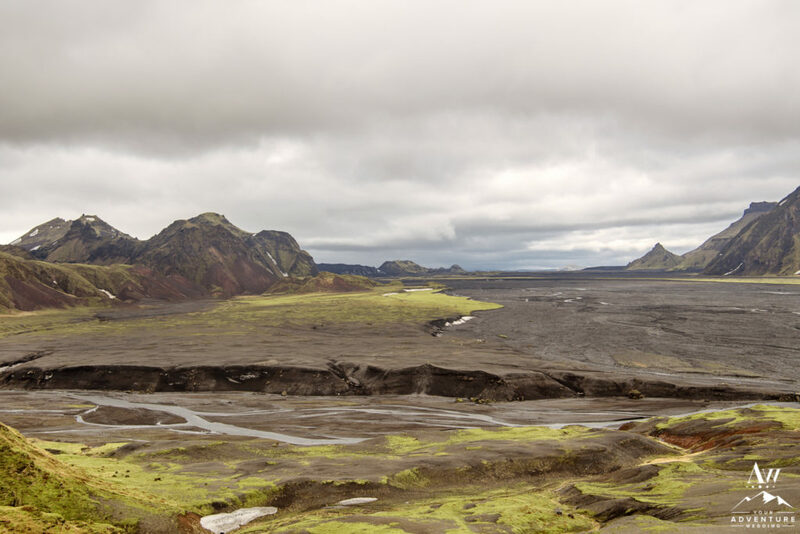 Canyons can be wide, narrow, long, and vary in height and colors. 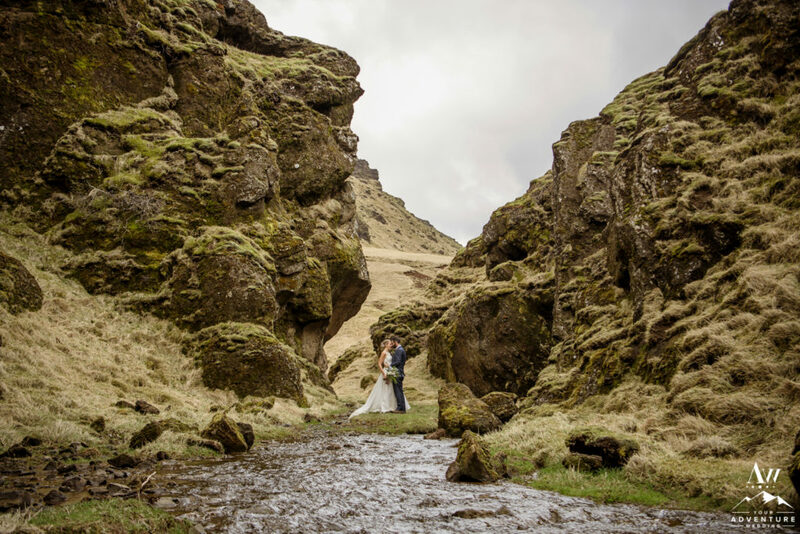 One of our favorite Iceland wedding locations is a narrow canyon which opens up to an incredibly beautiful wide canyon. 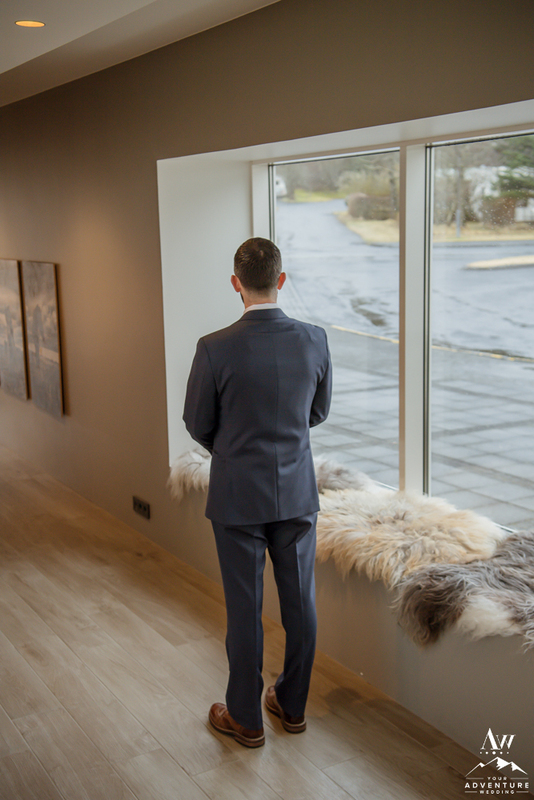 The area feels very intimate and alive! 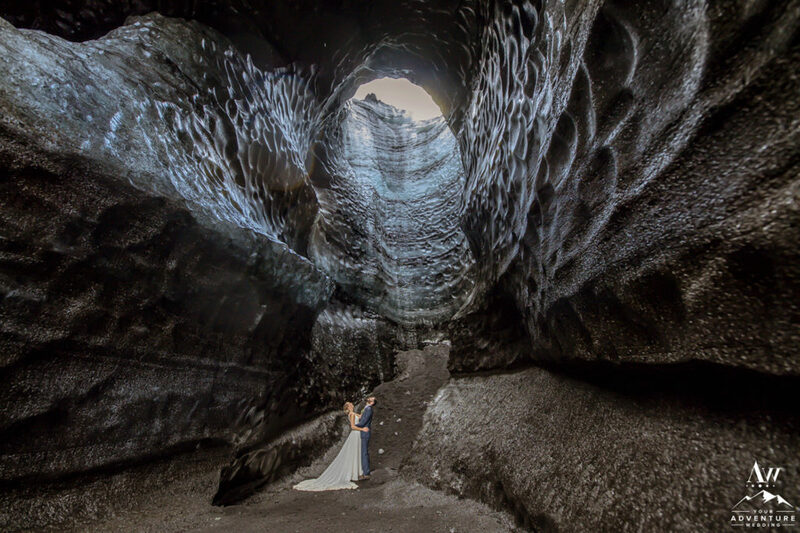 An ideal adventure wedding location stop for Jacalyn and Michael to explore together! 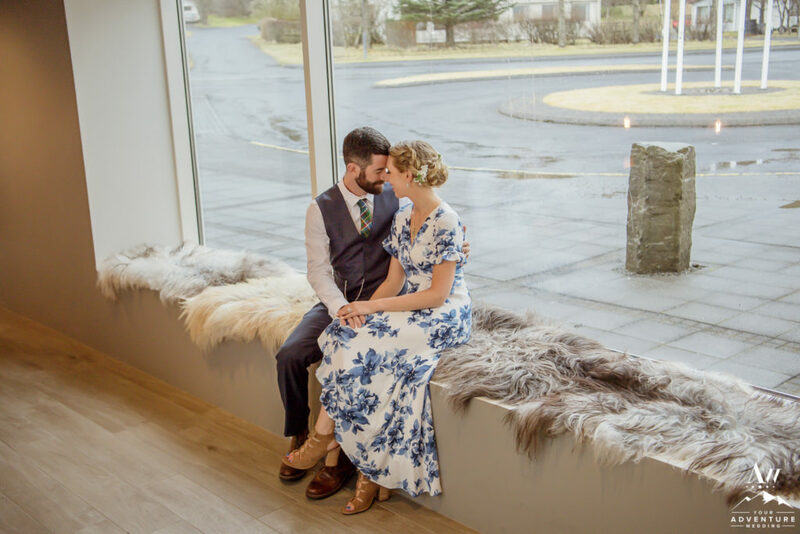 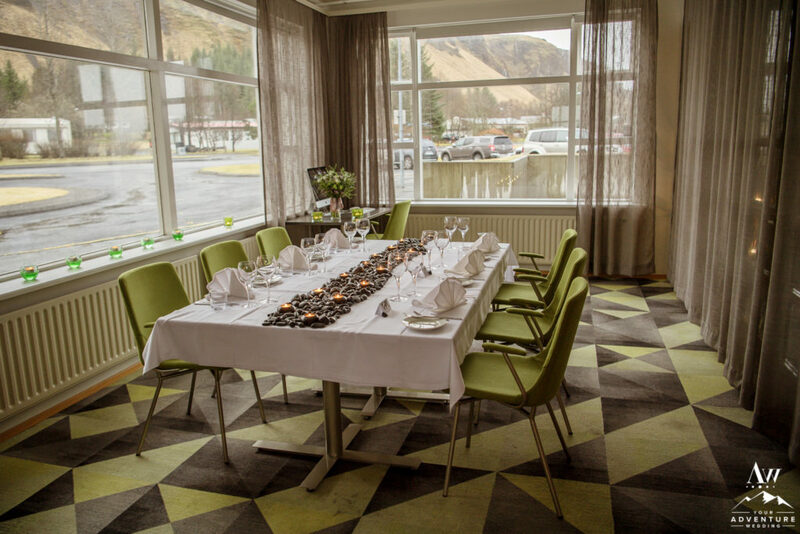 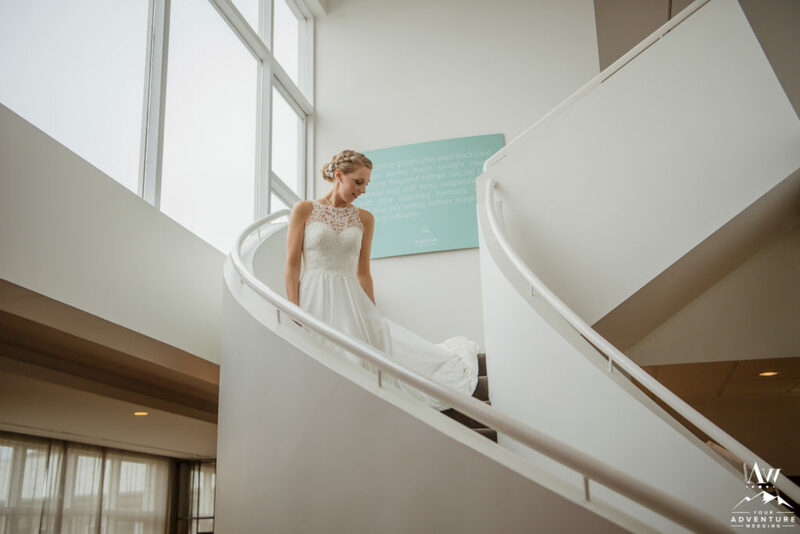 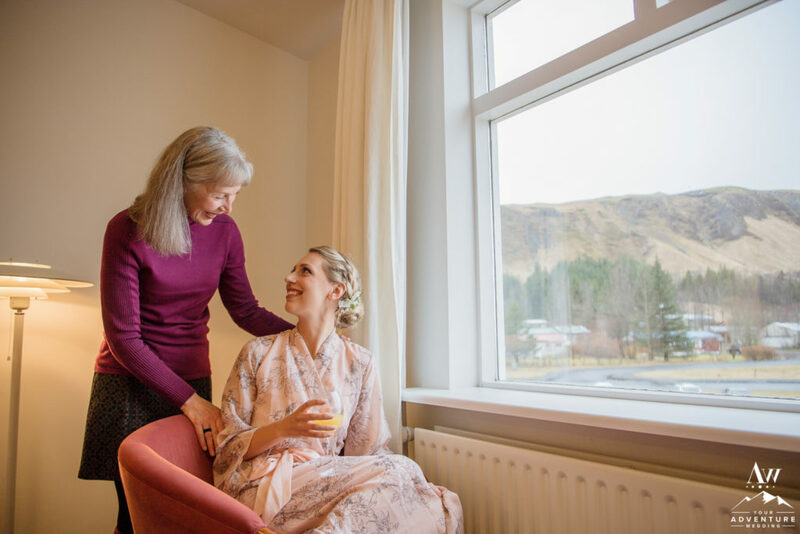 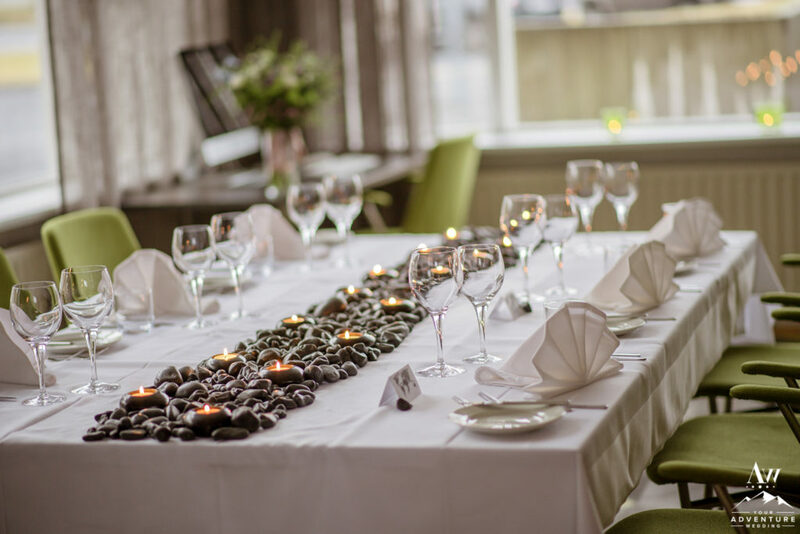 Upon arriving back to Icelandair Klaustur, the small Iceland wedding group was able to have a bit of time to rest and refresh before coming back down to an elegant reception. 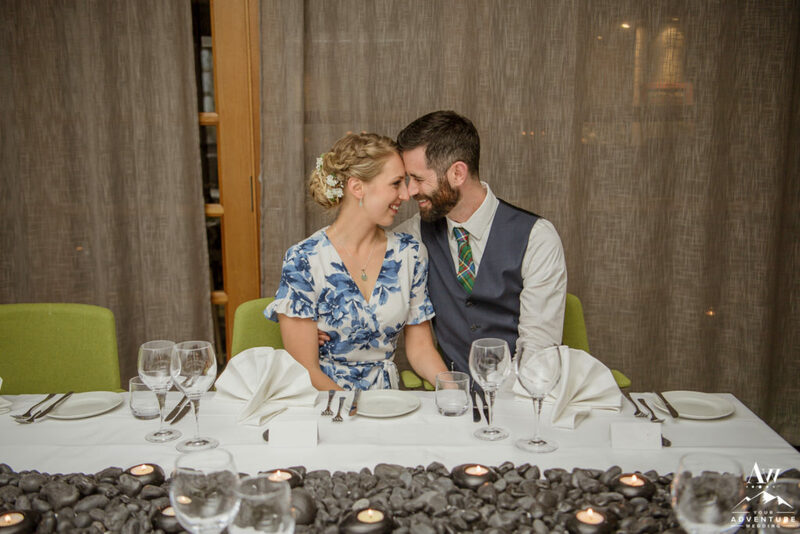 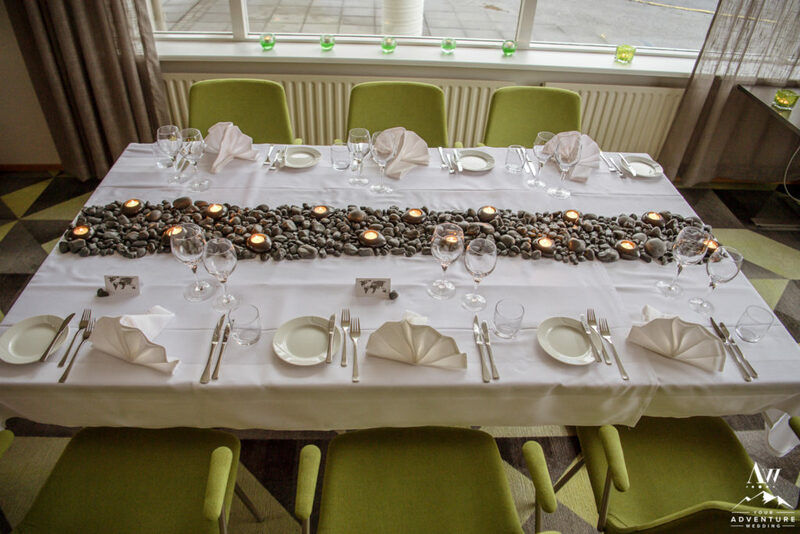 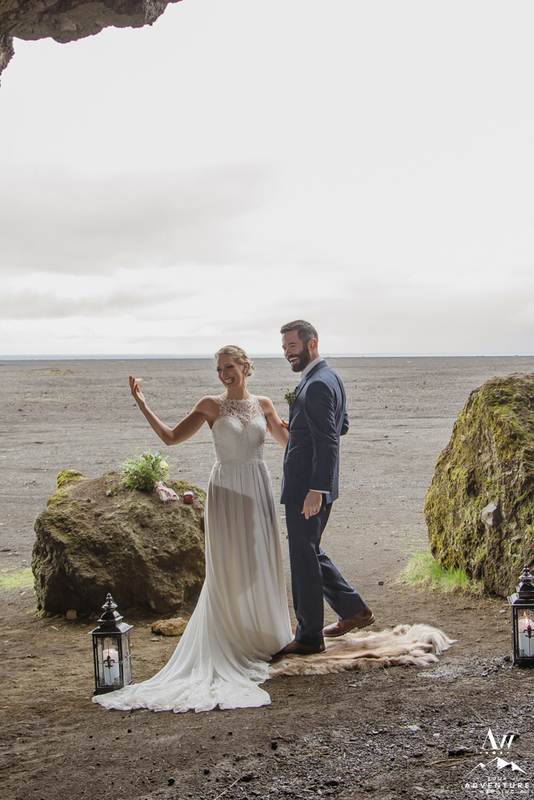 Jacalyn and Michael’s idea for their Iceland wedding reception décor was to have basalt rocks line the table as a table runner. 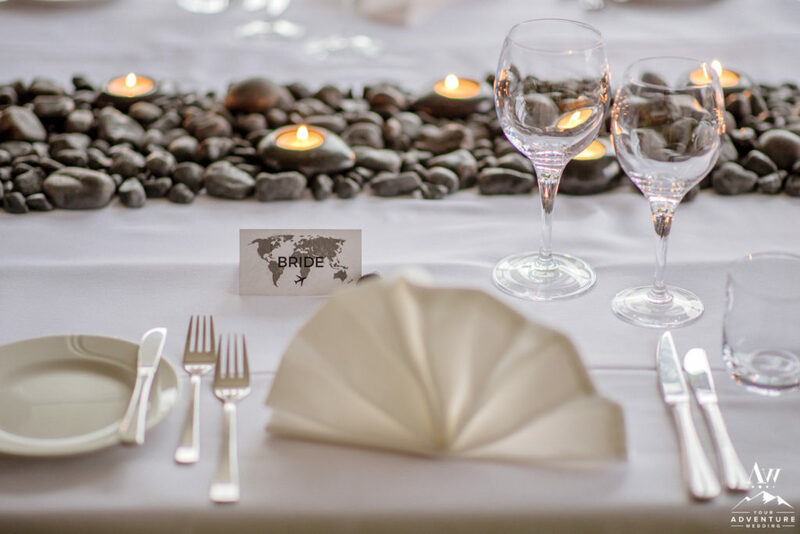 Mixed between were tea lights made from basalt rocks. 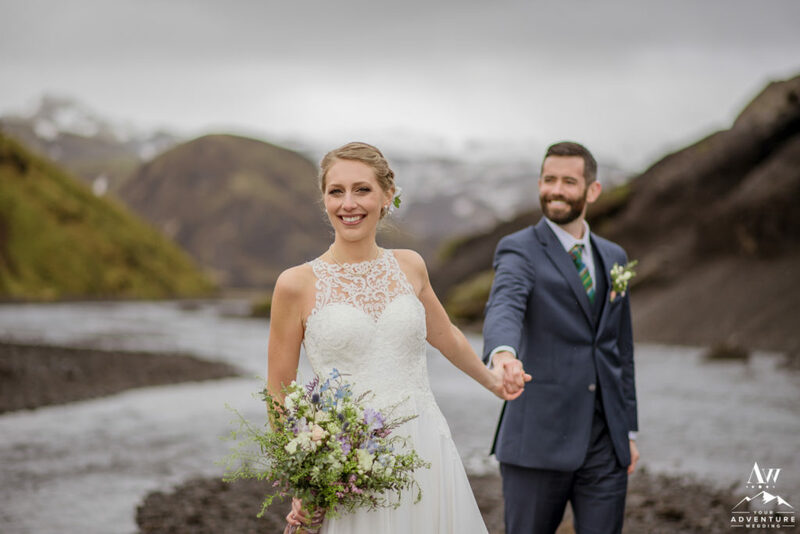 Our Iceland Wedding Planner team surprised the duo with gray map “Bride” and “Groom” place cards, which was so pretty and perfect for them considering their love of maps and traveling continues to be part of their core relationship foundation! 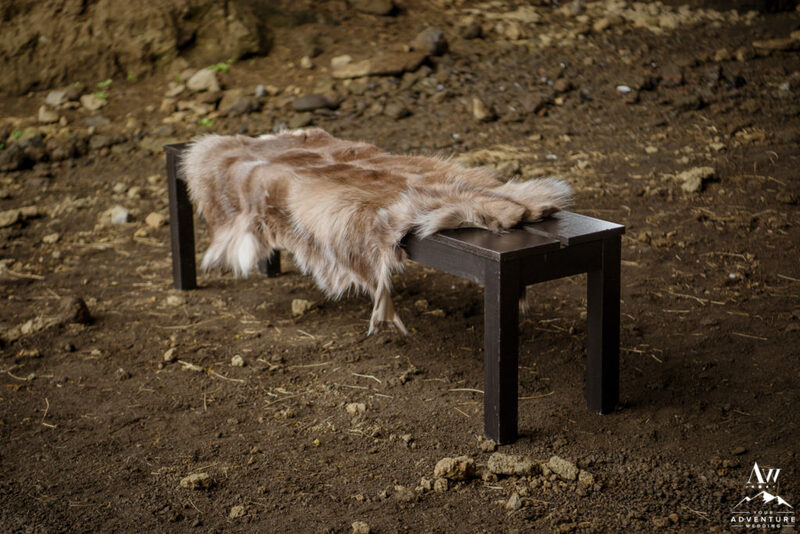 Painted Sky Films is one of my favorite video teams of all times! 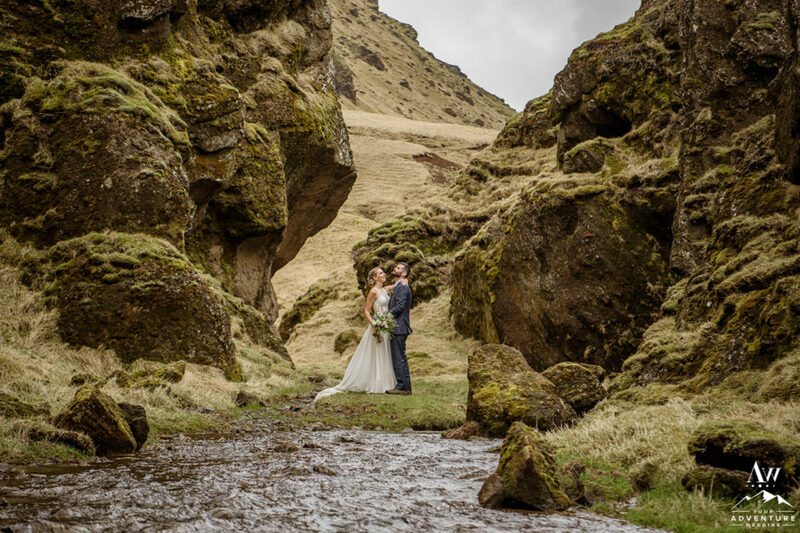 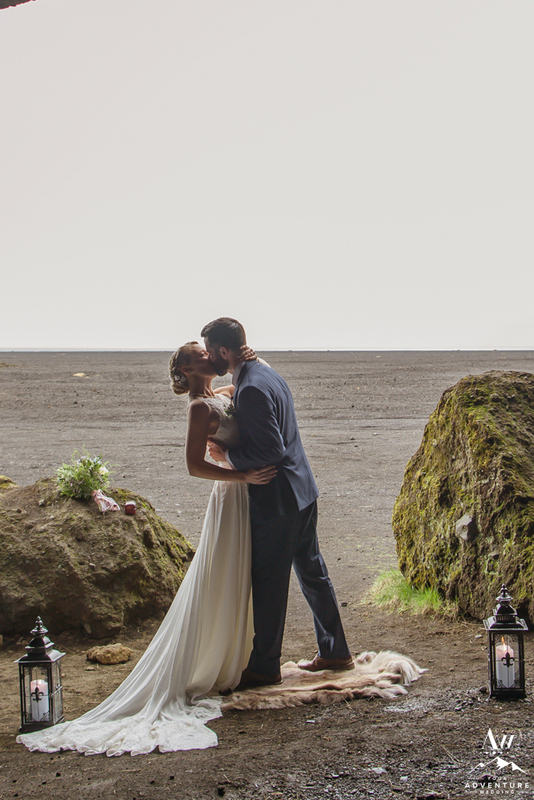 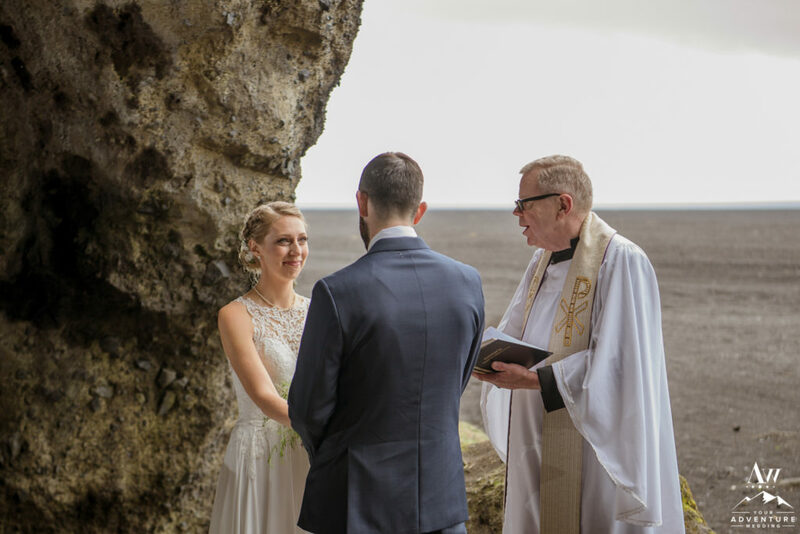 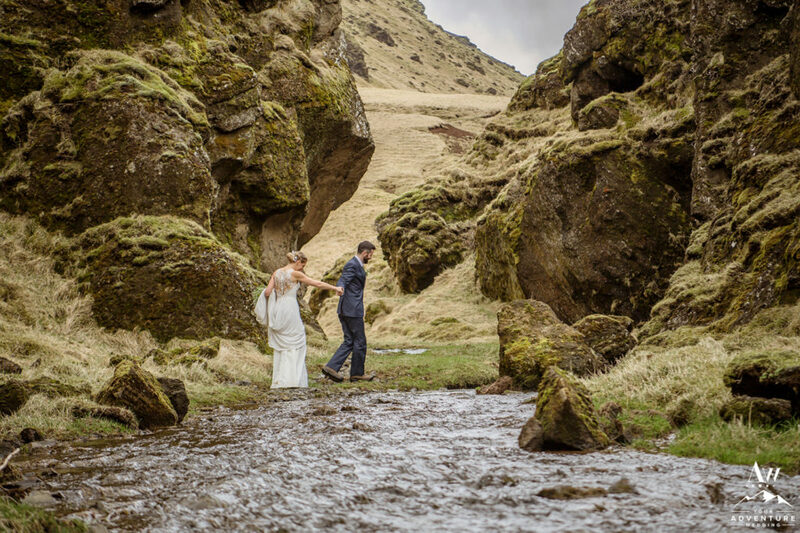 Jacalyn and Michael’s Iceland wedding video still makes us tear up months later! 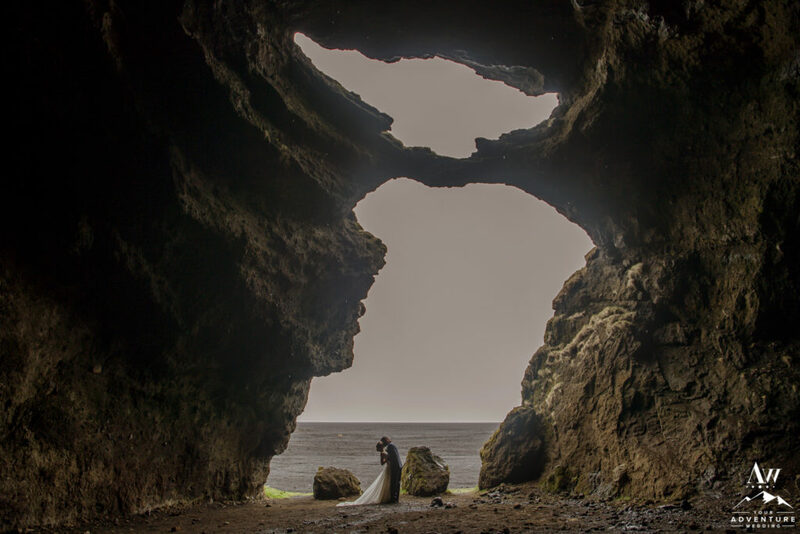 Go check out the awesomeness below!